Before I dive into the details of our build, I thought I’d share what we’re planning to do with the vehicle. 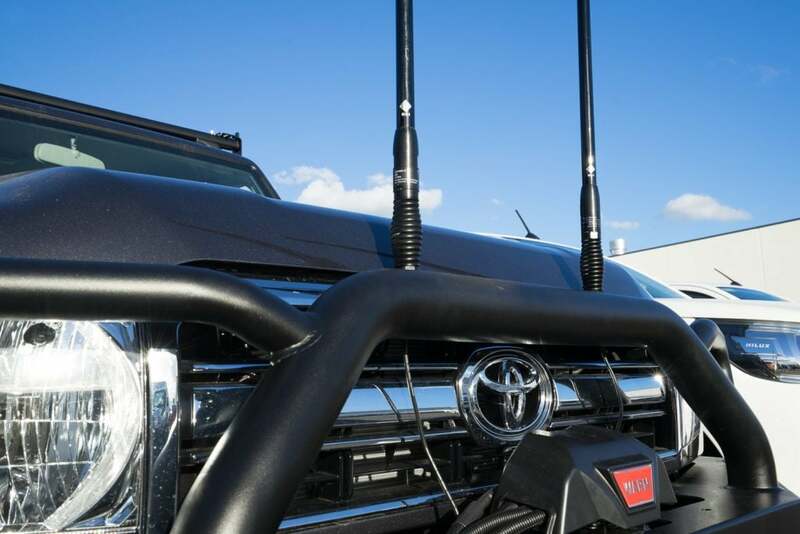 More than anything we like to explore isolated areas which makes reliability, toughness, 4×4 capability, range, water storage, payload and off grid power all critical. 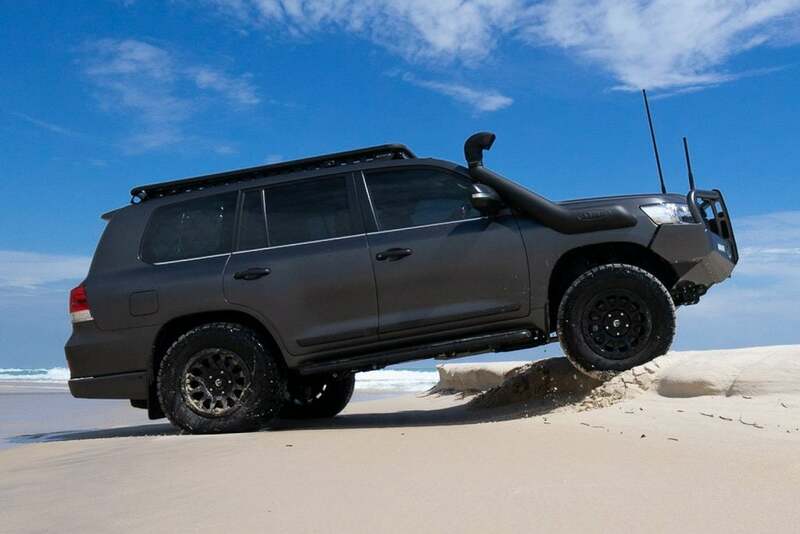 We’re preparing it to be capable of tackling some of Australia’s toughest remote tracks. We also do a wide variety of trips each year. Sometimes we tow camper trailers, other times we haul canoes or kayaks and we camp with swags, tents and rooftop tents. 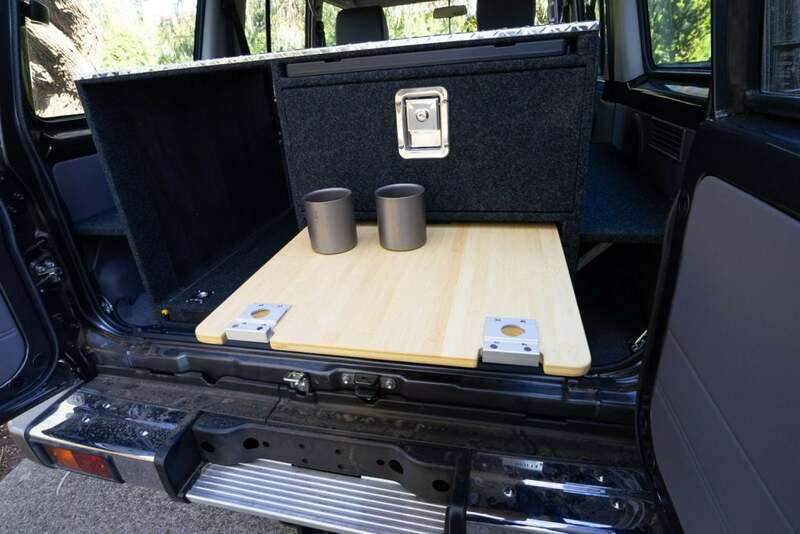 For remote trips we travel as two, but we wanted to be able to quickly configure to carry passengers too. Making the Cruiser modular and versatile would be the hardest challenge. 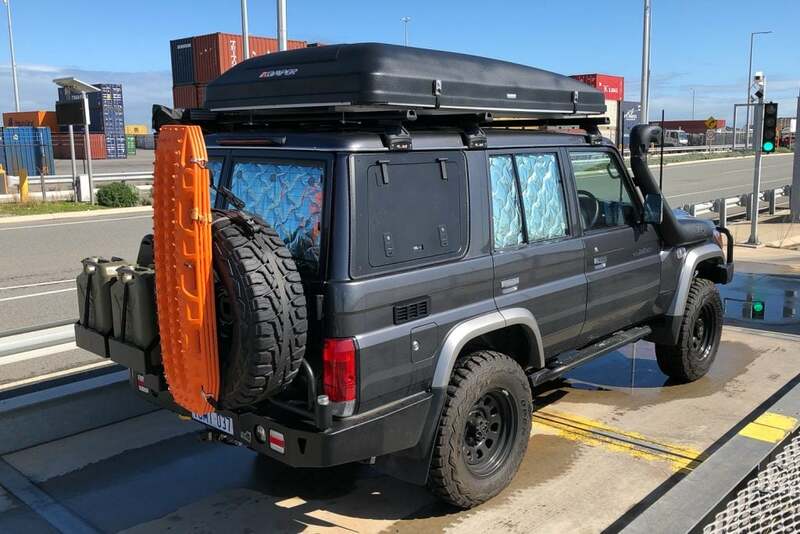 If we were setting up a vehicle exclusively for long overland style trips, like from Tierra del Fuego to Alaska (hopefully one day) I’m sure the build would look quite different. 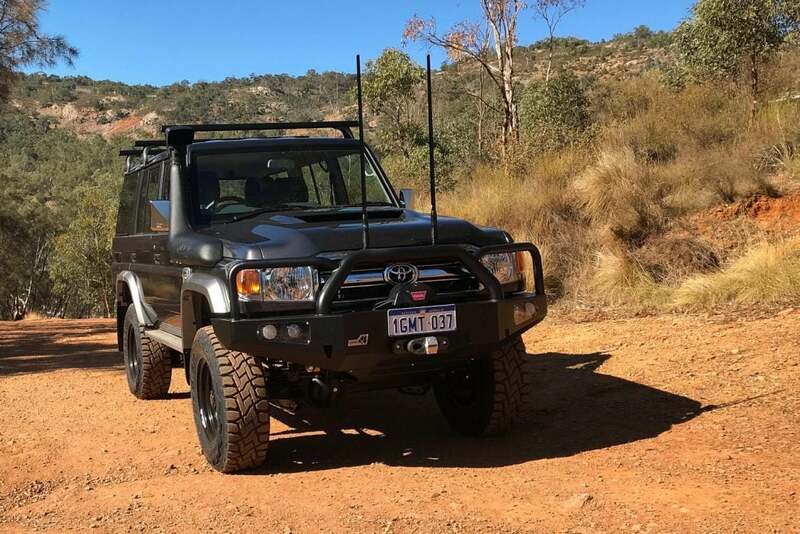 With their commercial build quality and reputation for reliability for us the Toyota LandCruiser 70 Series range was the obvious vehicle choice. 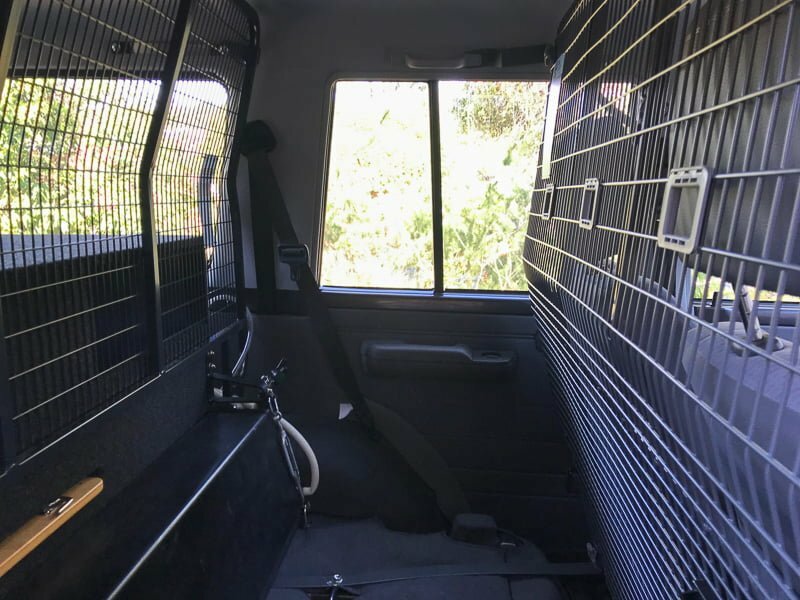 As for the choice of a 76 Series wagon, on long trips there are usually only two people travelling, so with the rear seats out it has all the room we need, plus I love wagons. We bought ours through Melville Toyota and it’s a 2018 GXL model, complete with dual factory electronic diff locks. So let’s have a look at the progress. 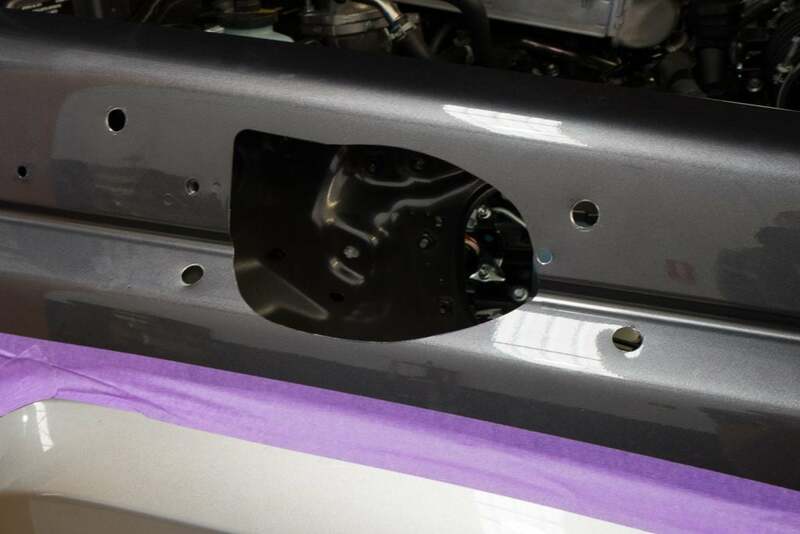 We’ve replaced the factory fitted raised air intake with a fully sealed Safari ARMAX snorkel. 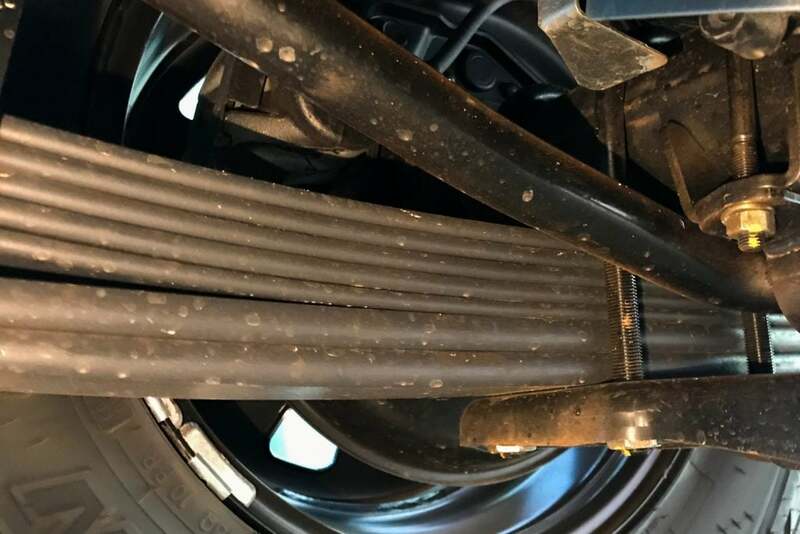 These keep water out of the precious engine much more effectively, and at four inches in diameter they deliver 50% more air to the whopping V8! For towing duties we fitted a Hayman Reese Heavy Duty Tow Bar with the new anti rattle SmartPin. 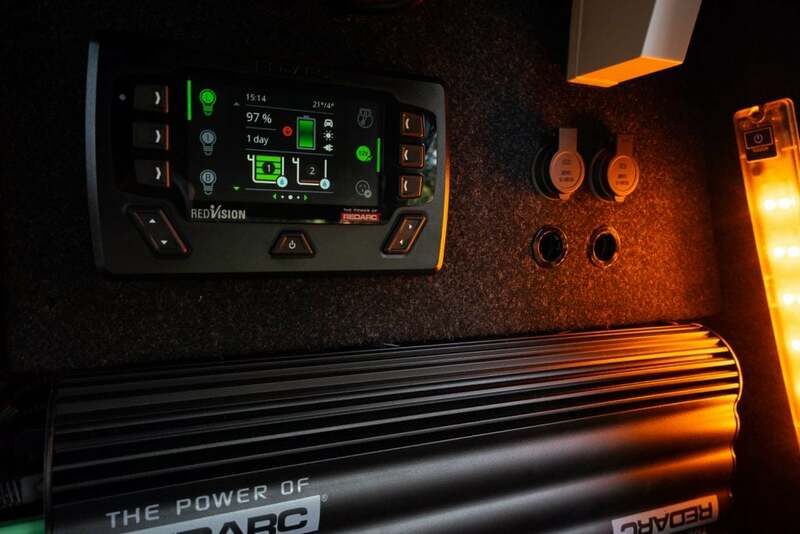 Inside the bar we bolted a WARN ZEON 10-S winch. 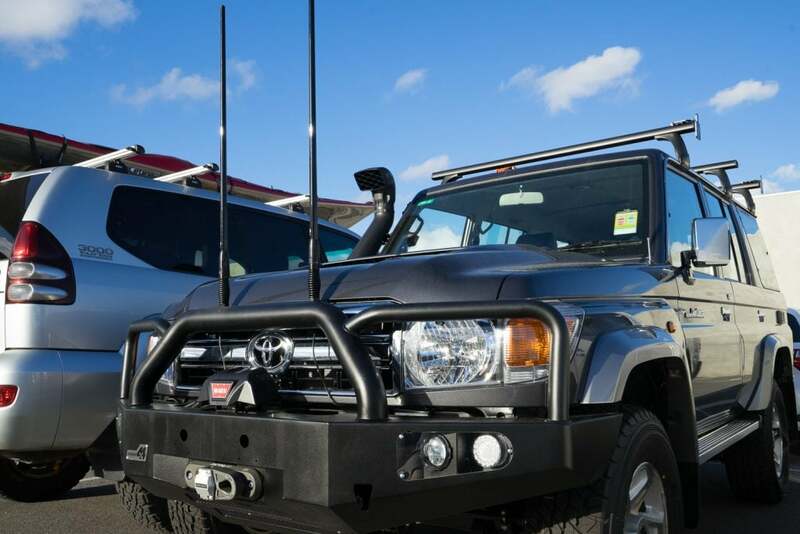 We do lots of trips with one vehicle, so for us it was great to have the peace of mind of a quality winch. We chose the Spectra version at 27kg is 17kg lighter than the steel version. 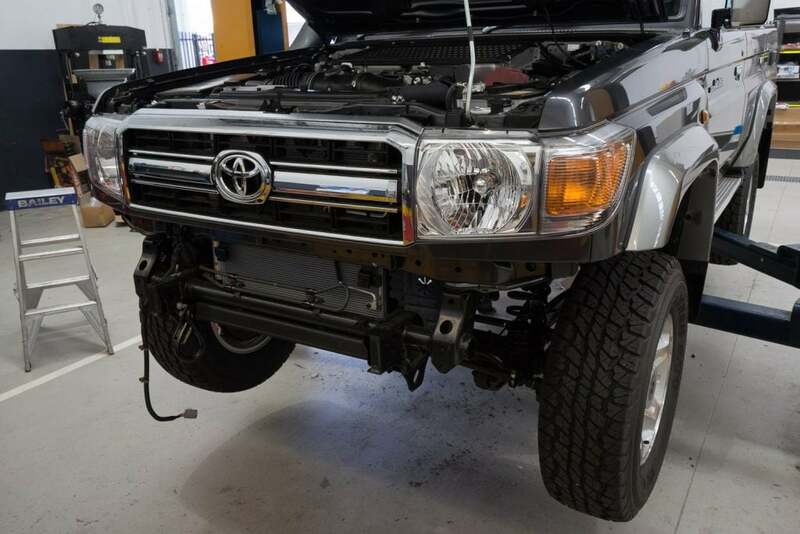 For our new baby we’ve chosen a Uneek 4×4 bull bar. 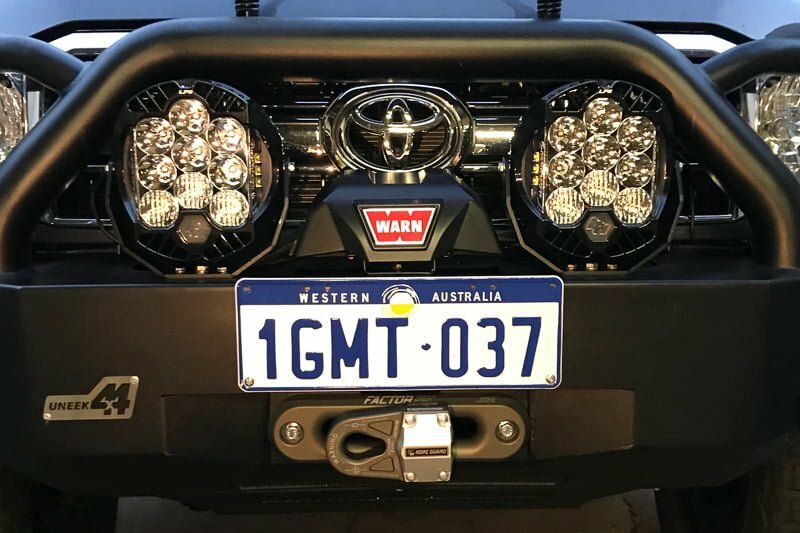 It’s Aussie made, steel, and at 55 kilograms is relatively light due to the low profile and the small diameter tubing over the lights. 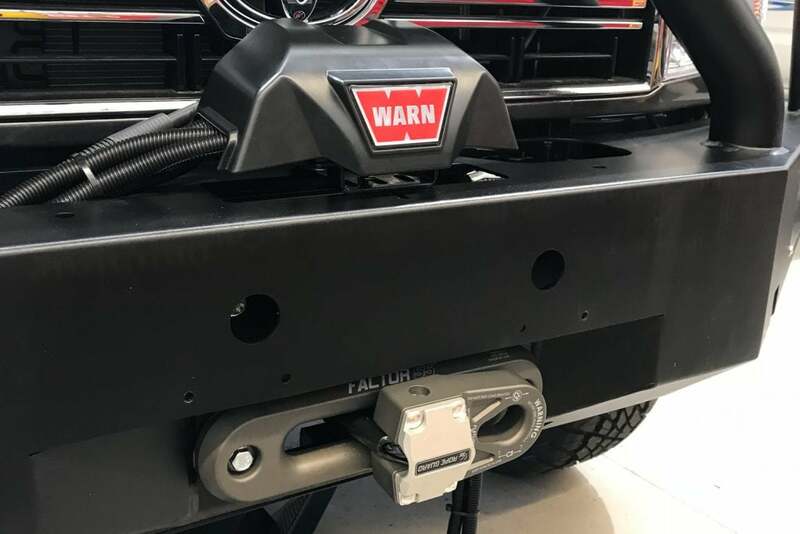 We’ve also fitted a Factor 55 Fairlead and Flatlink E. The Flatlink allows for safer winching connections through what’s known as Closed System Winching. 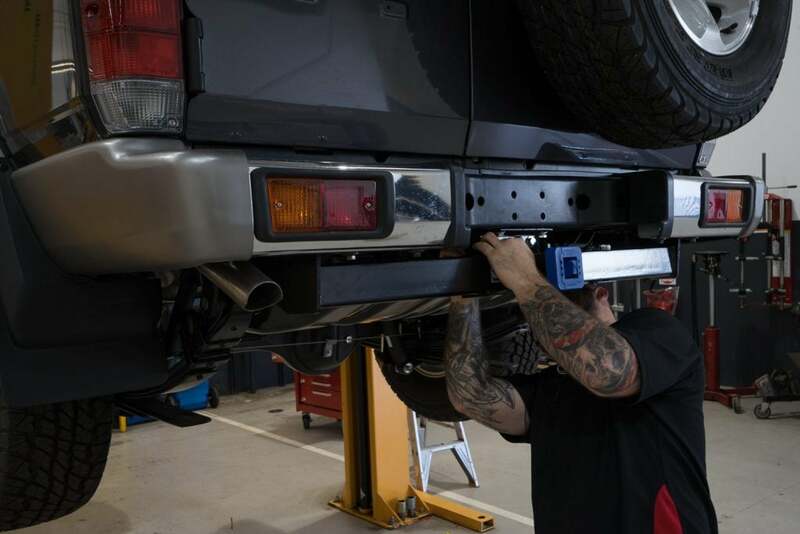 Anything that makes recoveries safer is something we’re keen to try out. We’ve mounted two RFI Antennas. 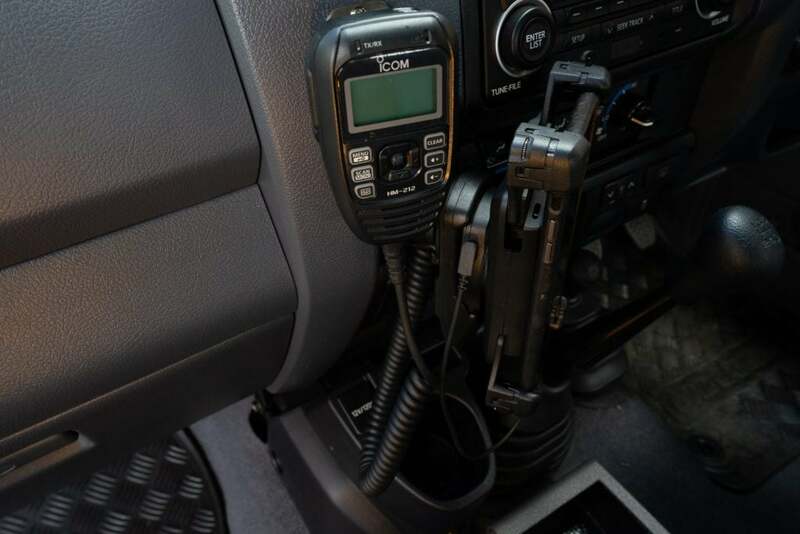 The CDQ7195 connects to a Bury iPhone cradle, and the CDQ5000 to our Icom IC-450 UHF radio. In the city/country pack the CDQ5000 comes with the CDQ34, a short whip which is designed for getting in carparks, but I think we’ll use more to increase driver vision when we don’t need 5dBi of gain. 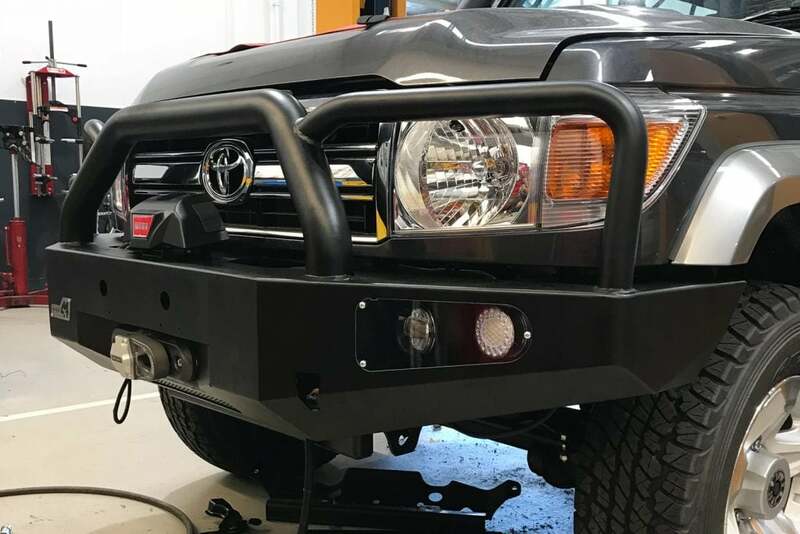 We’ve mounted ROLA Heavy Duty cross bars. They have a high load rating and are light. 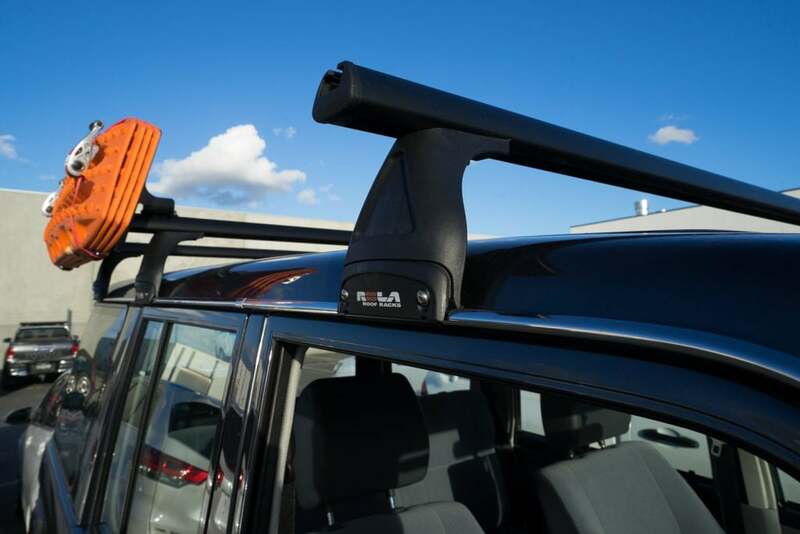 For carrying sea kayaks, whitewater kayaks, canoes, surfboards and rooftop tents we find cross bars the best. 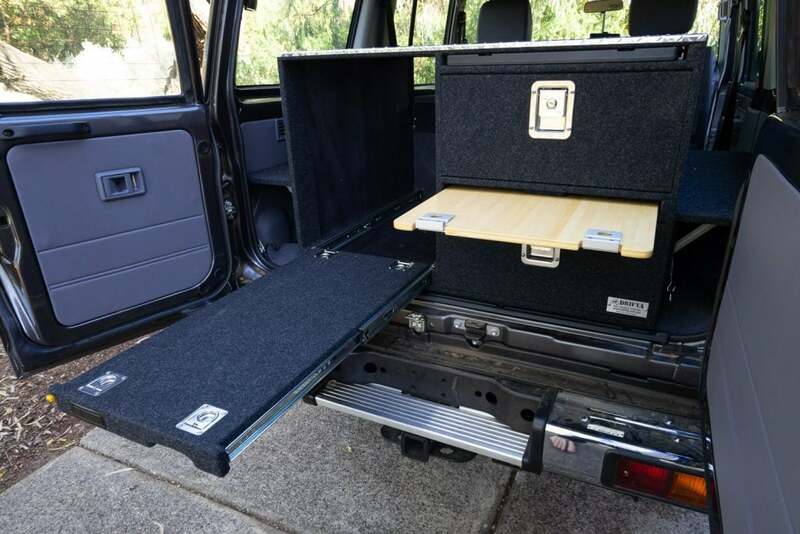 We’ve also have a flat ROLA Titan Tray for when we need to load lots of gear up top. 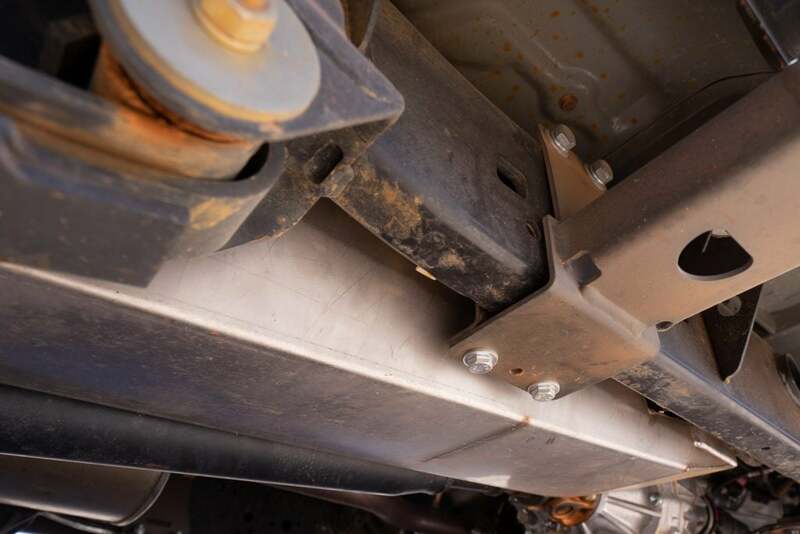 It simply bolts on top of the cross bars – we’ll show you that at a later date. 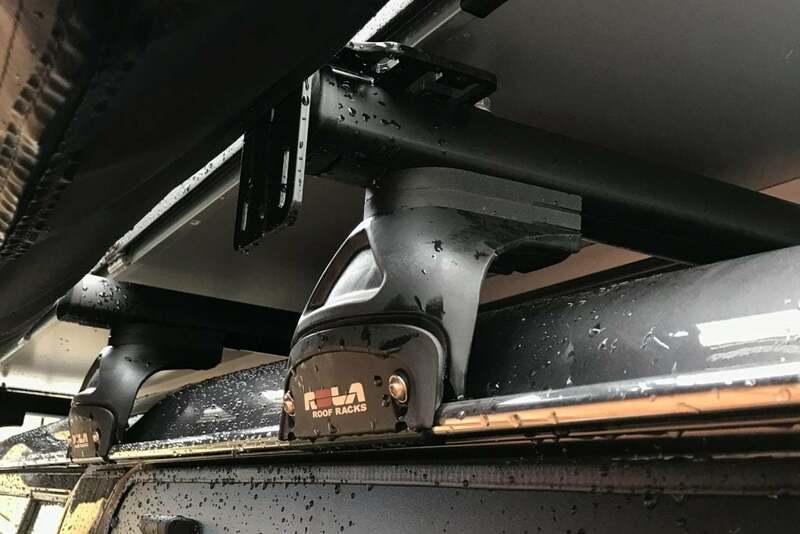 The ROLA Awning Brackets mount on their HD Bars or Titan Trays. *Update – We’ve changed the taller ROLA feet out for their smallest ones with 20mm spacers. It gets the centre of gravity of our vehicle a bit lower. 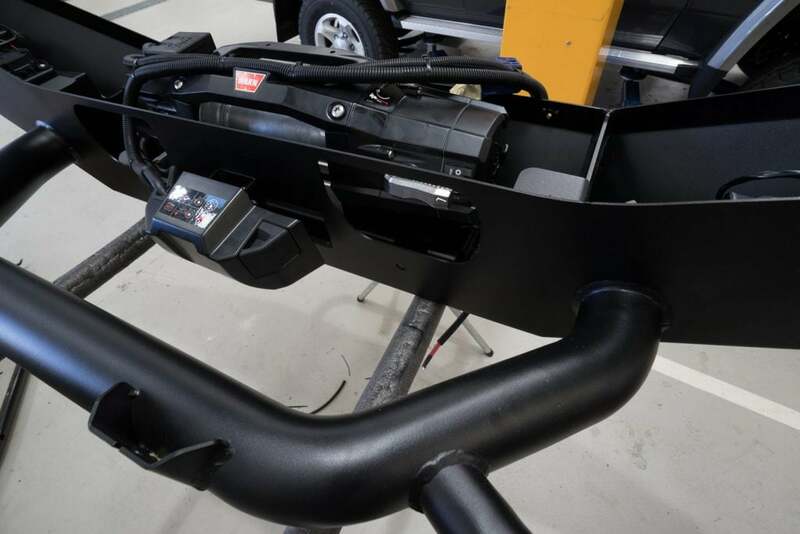 Our electrical system will go in soon – but we wanted to give you a sneek peek at the parts that have just arrived. We’re stoked to get hold of the new REDARC REDVISION ahead of it’s consumer release. 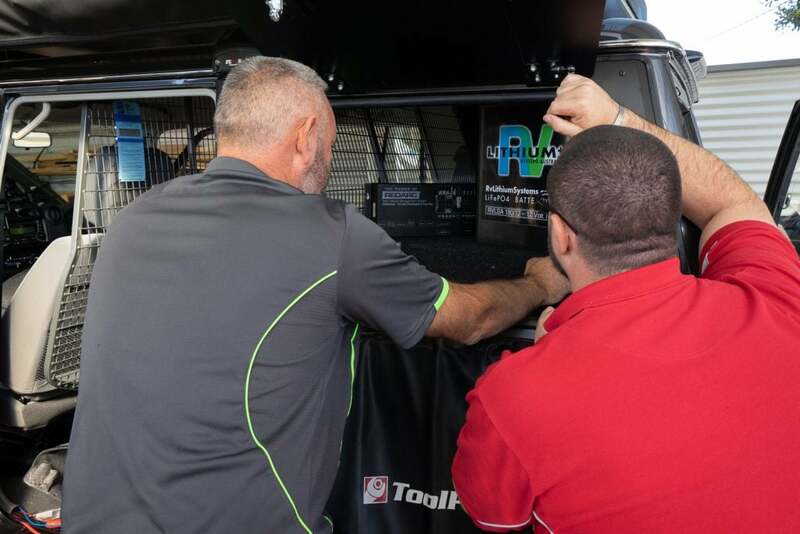 REDVISION is a vehicle management system. The display (or APP) controls the connected accessories. In our case this will be two water tank pumps, our UHF radio, fridge, air compressor, inverter, interior lights and USB sockets. It also displays the battery levels, water tanks levels and lots more. 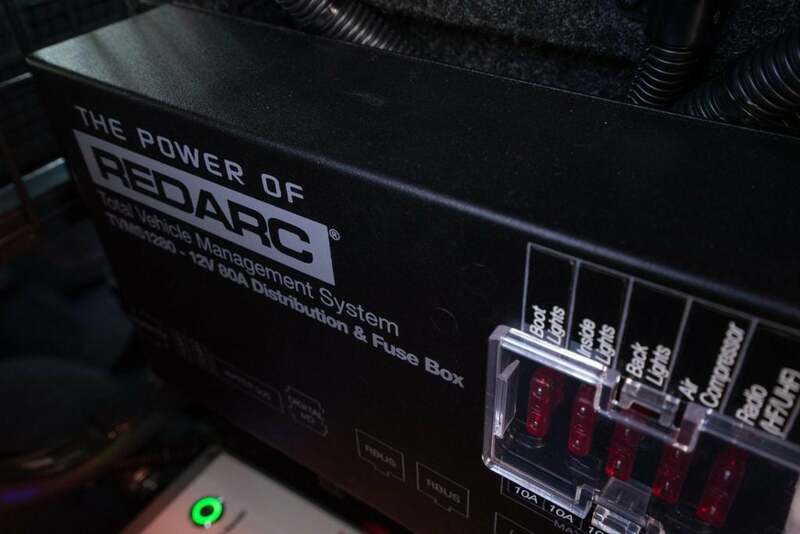 The REDVISION connects with the REDARC Manager 30 to smart charge a variety of deep cycle battery types (including lithium). 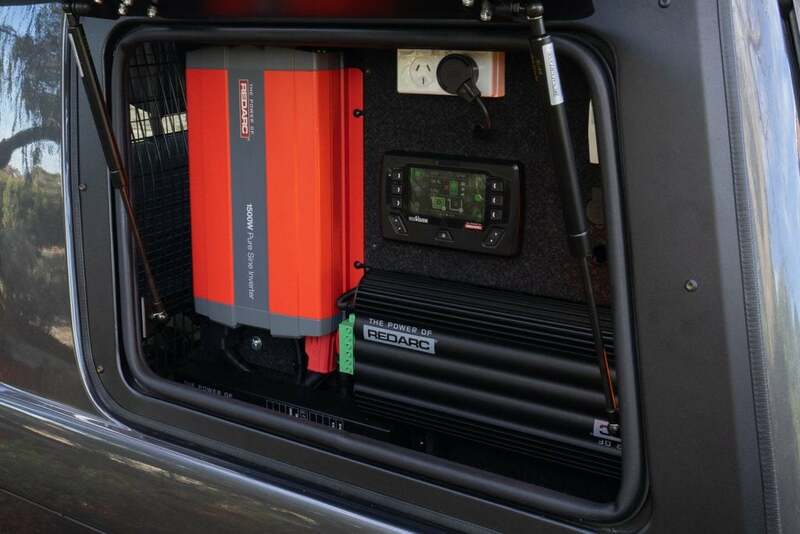 It has an inbuilt solar regulator and enables charge from the vehicle and mains power. 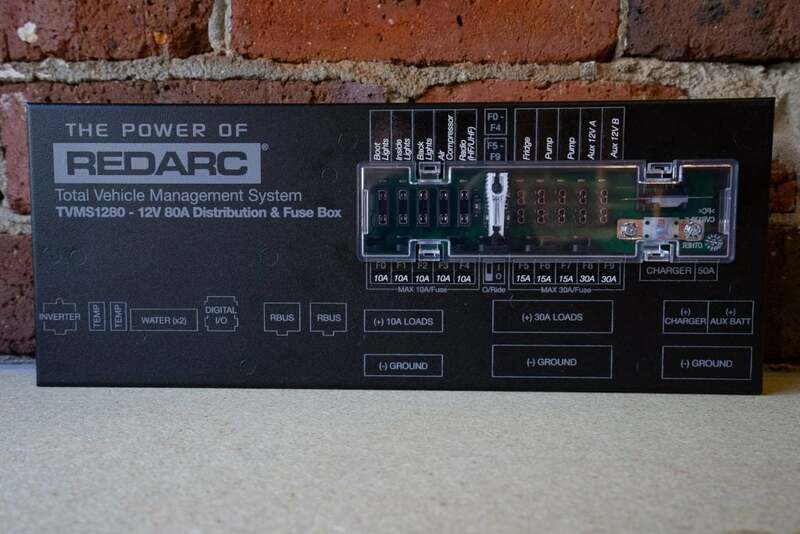 The REDVISION Distribution & Fuse Box is absolutely impressive. We can’t wait to see how simple and neat the wiring turns out. 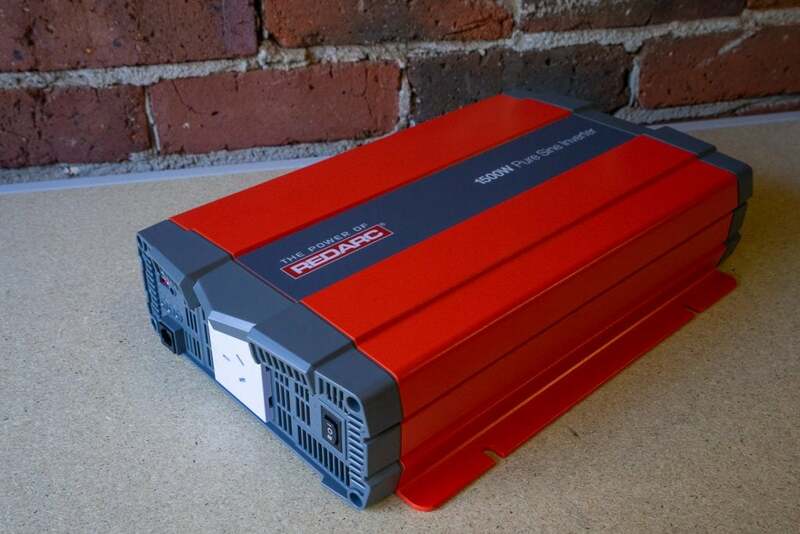 The REDARC 1500W Pure Sine Inverter should allow us to charge all of our cameras, drones, radios and laptops at once. 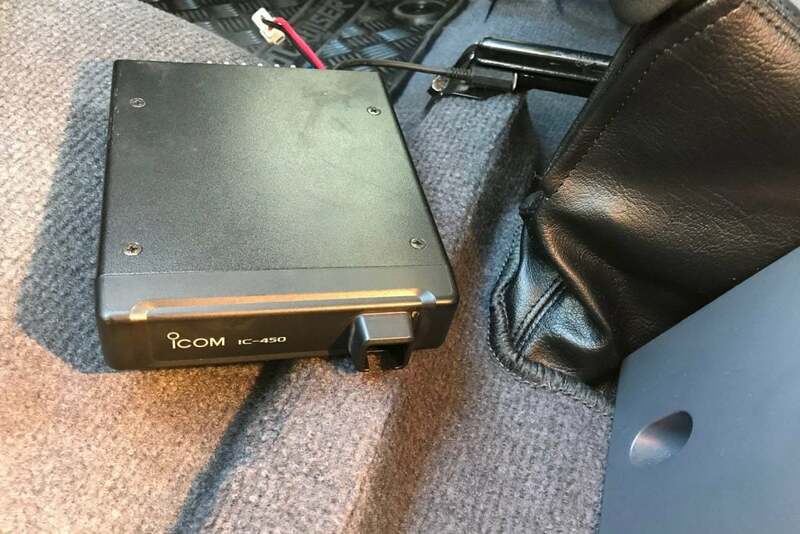 We’ve pulled our Icom IC-450 UHF radio from our Prado. These things are bullet proof. Now where to mount it? 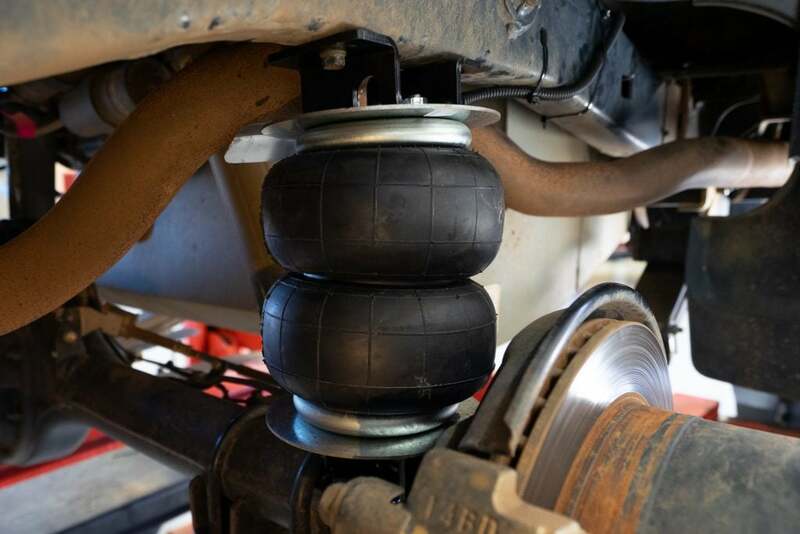 Suspension wise we’ve chosen ARB BP-51s. We’ve upgraded the GVM to 3,660kg. From the tare weight this gives us a hefty 1,495kg to cover the build, plus everything we might need for remote trips like the Canning Stock Route. The 76 Series is known for it’s toughness, not comfort. 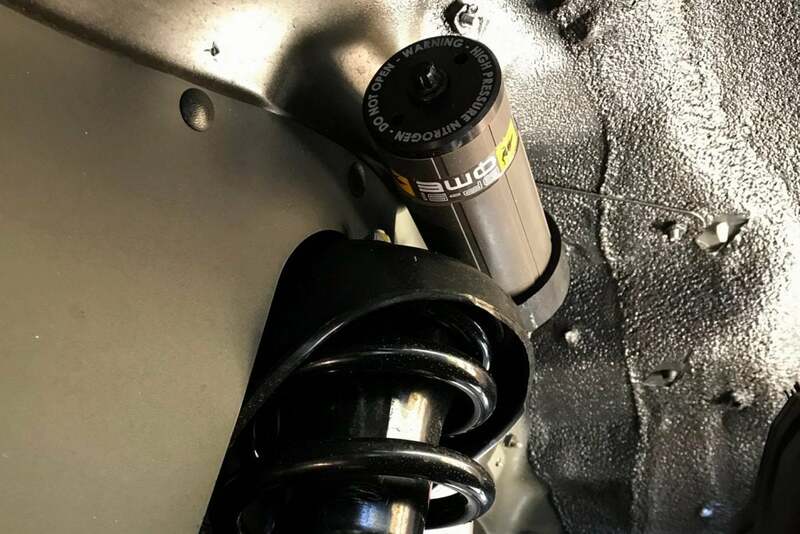 We’ve heard great things about the positive difference the BP51 shock absorbers make – we can’t wait to try them out. *Update we’ve added an extra leaf in the rear so the leaf packs are now 600kg constant load, up from 400kg. 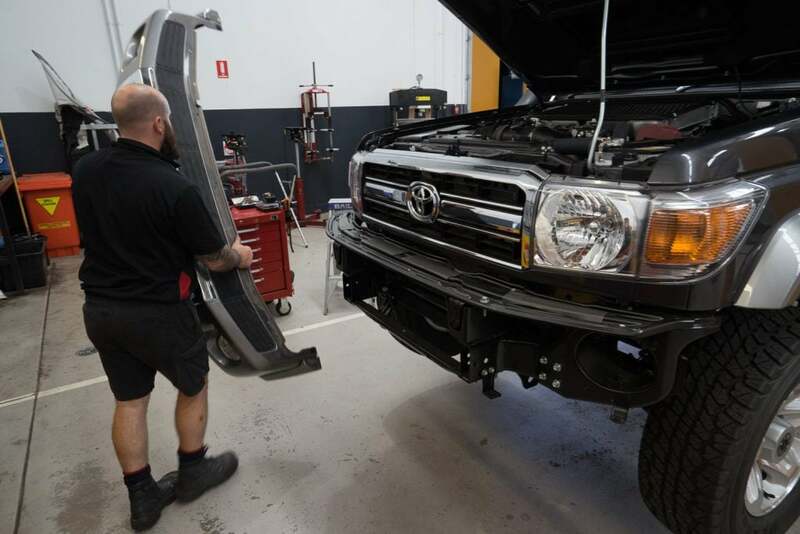 The guys at Booragoon TyrePower fitted up our TOYO Open Country Rugged Terrains. 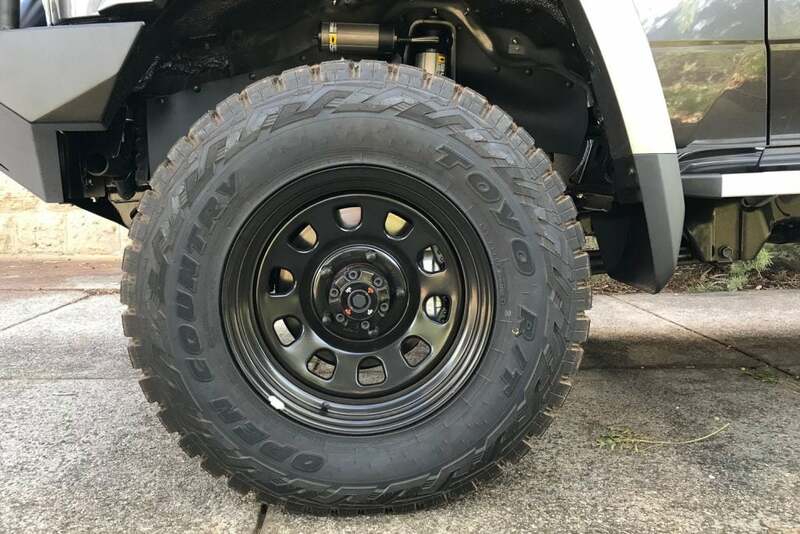 These tyres sit between an all terrain and a mud terrain. With the long highway drives to get to the remote tracks they look like to fit a great niche – we’ll let you know how they go. We’ve fitted 28570R17s (32.7″), which is up from the factory GXL tires which are 26570R16 (30.6″). 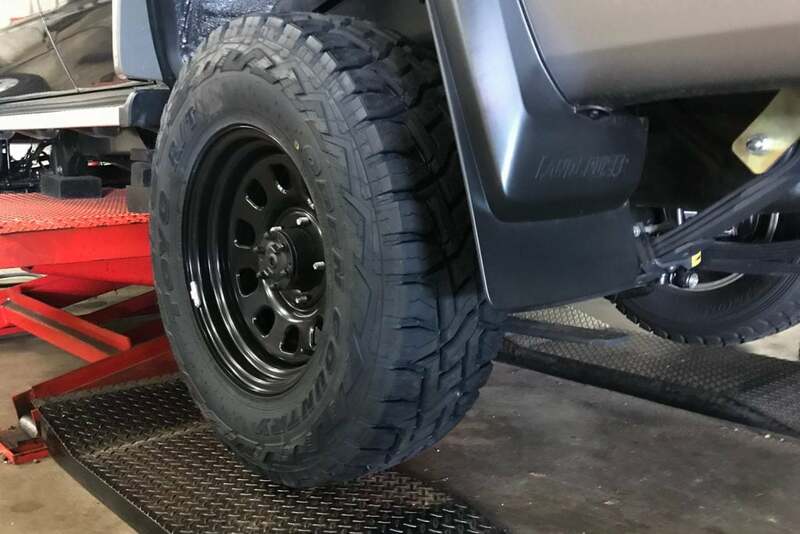 With the factory rims sitting at 7″ wide, we’ve changed to 8″ wide rims to fit the tyres. The wheels are Dynamic D steelies, are rated to 1,200 kg apiece, and are all 0 offset. With the lift and bigger tyres, there is still plenty of room at full lock, and for articulation without striking. Gen is big on the naming of vehicles. A few ideas floated, but one of her earlier suggestions seems to have stuck – meet Tintin. It’s great to finally have him on the road! As we approached registration, insurance was the next thing to research. 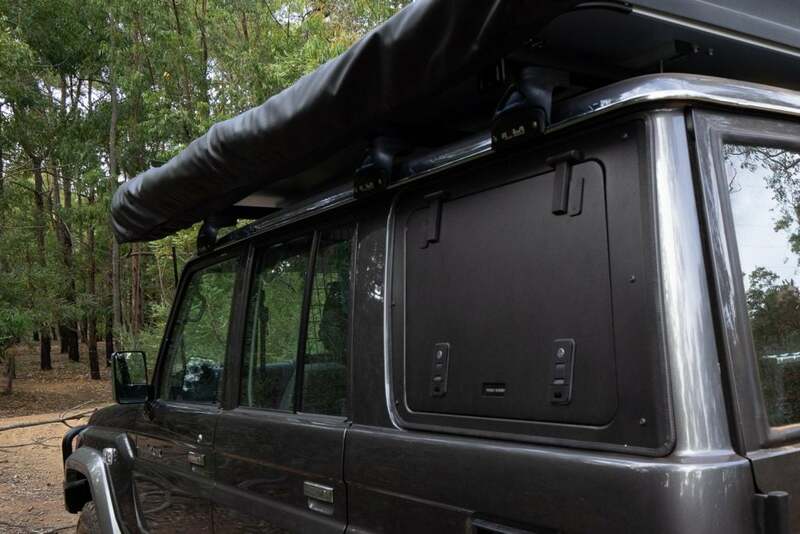 The real challenge for remote travel seems to be covering everything that is bolted to the vehicle, plus all the areas you may end up travelling. 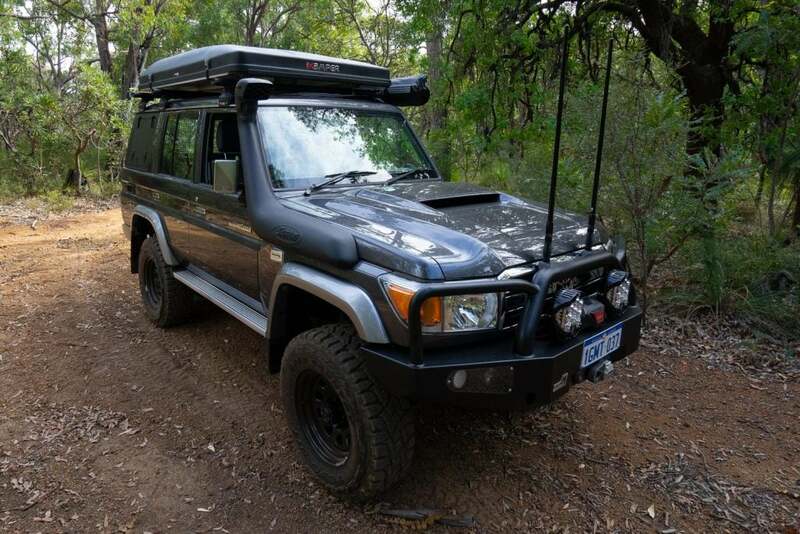 I openly quizzed Club 4X4 and they weren’t phased by big builds or plans to travel places like the Canning – so we signed up. On some trips we carry some gear up top. 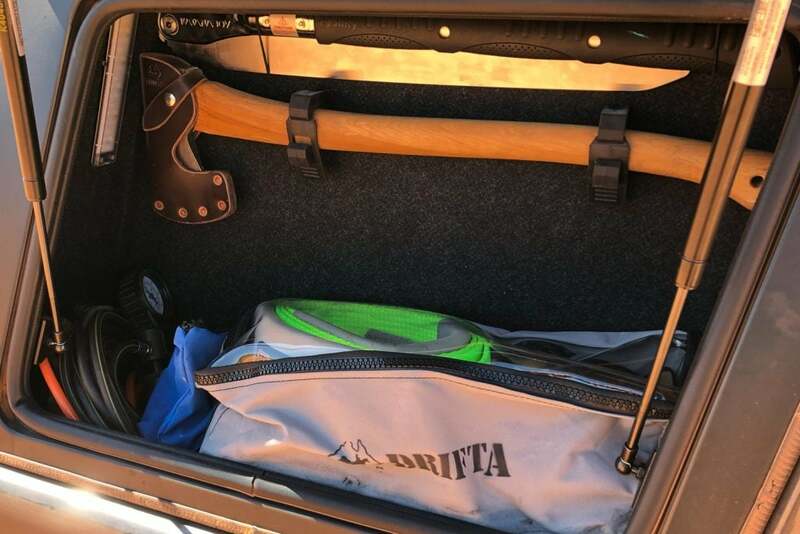 On the weekend we loaded up our ROLA Titan Tray and took it for a test run. 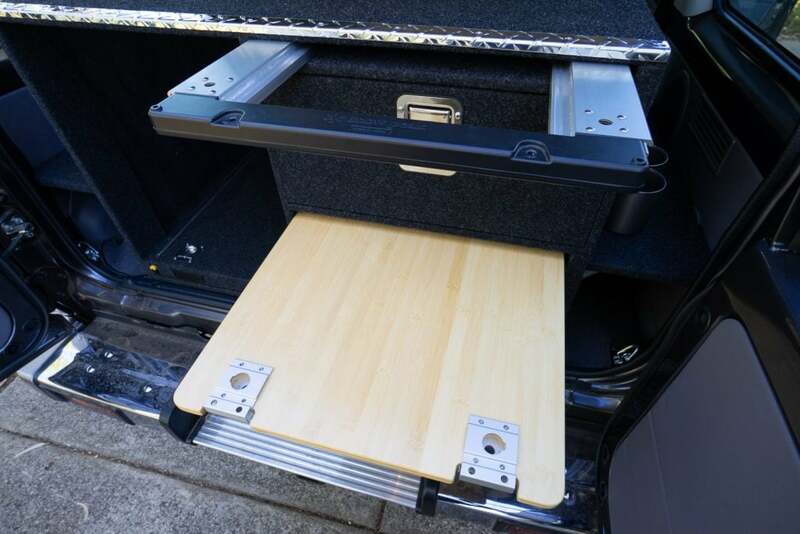 It’s a relatively light platform, and is easy enough for one person to fit. 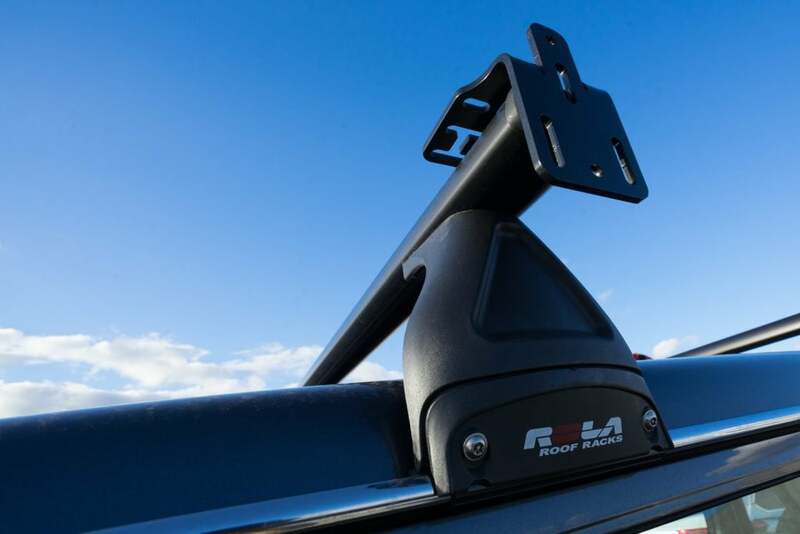 ROLA make some solid accessories which are all quick to fit and adjust. 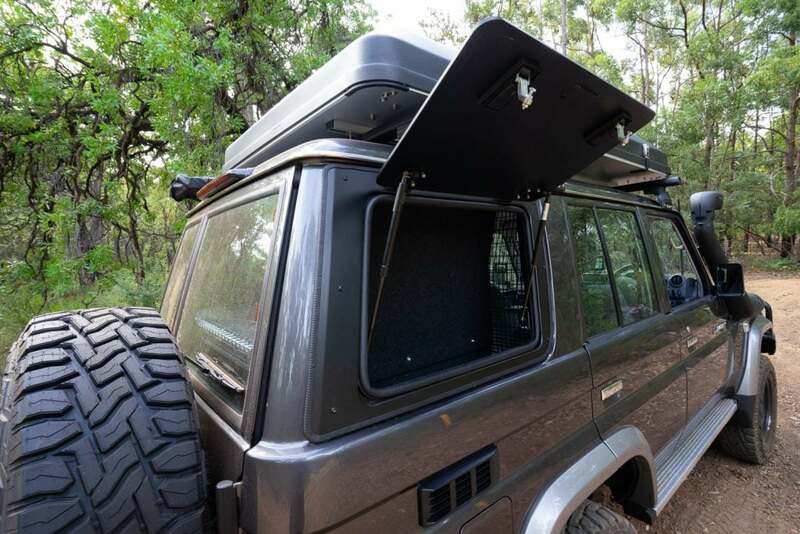 They build brackets for jerry cans, gas cylinders, spare wheels, awnings, MAXTRAX and more – and most work with tailored ratchet straps to cinch everything tight. With the arrival of our DRIFTA custom drawers our internal fit-out is starting to take shape. We were really happy with the big drawers, simple fridge slide and water tank of our last unit, so this version is pretty similar. The team have really cleverly built in slots to store a kitchen the Snow Peak Iron Grill Table (IGT). We’ve got the IGT2 and the Extension Bench. Duplicating how they fit their standard tables, the DRIFTA team have fitted the Snow Peak Extension Table so that half out it’s fully support and can be used as a bench. This was the favourite feature of our last drawers. Coffee, breakfast, lunch and laptop station – we couldn’t live without it! We’ve seen some units with an extra stove slide under the fridge slide. 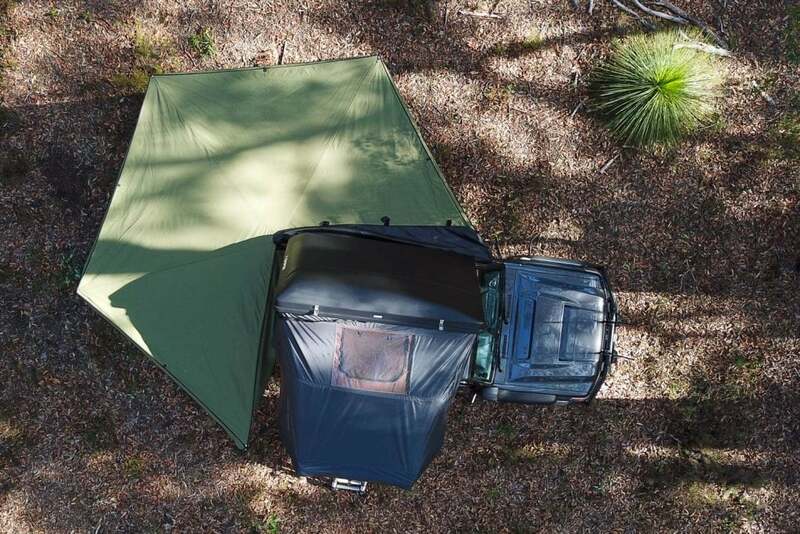 We looked at doing this, but decided we prefer to be able to have the option of moving the kitchen away from the vehicle, or to leave it behind under the Hexatarp we carry if we’re based for a few days and want to go for a drive. The Snow Peak IGT setups are like the Lego of camp kitchens. 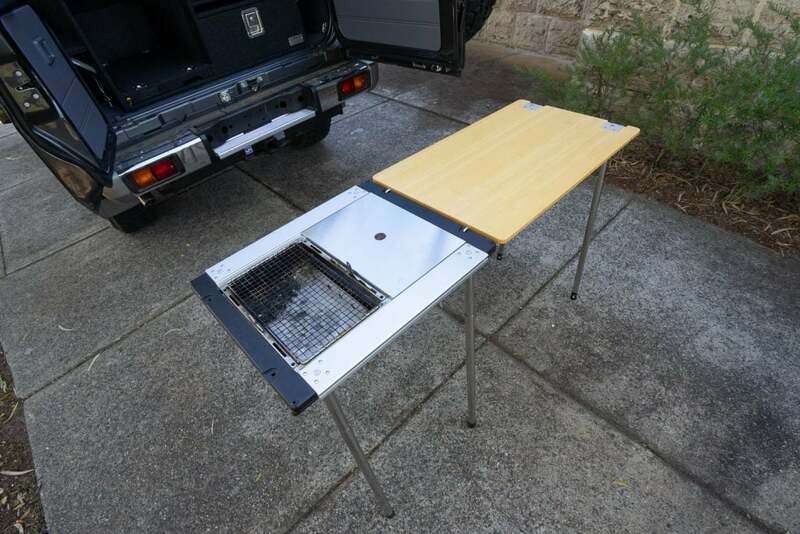 We can drop in our BBQ Box or stove, and there are heaps of other accessories to choose from. 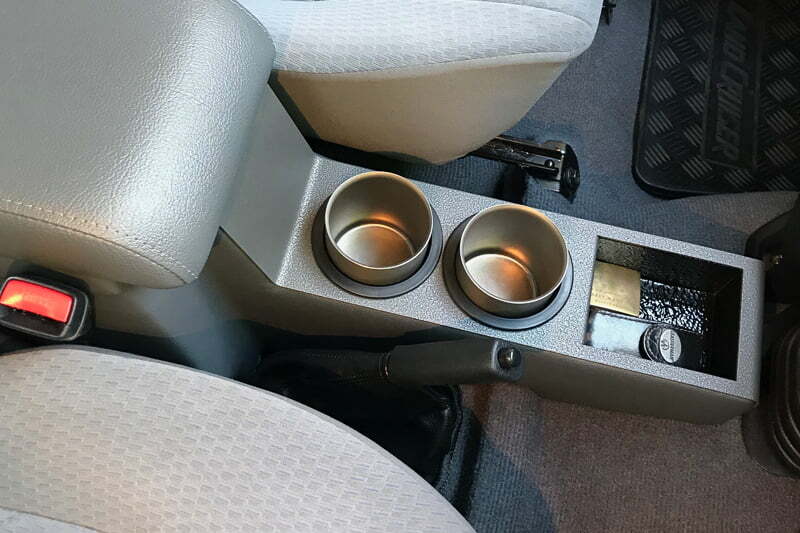 We’ve fitted a Cruiser Consoles Centre Console – the all important coffee for two. Up front we’ve bolted a pair of Baja Designs LP9s. They pack 11,025 forward projecting Lumens, a further 1,120 to cover peripheral lighting – we can’t wait to test them out. 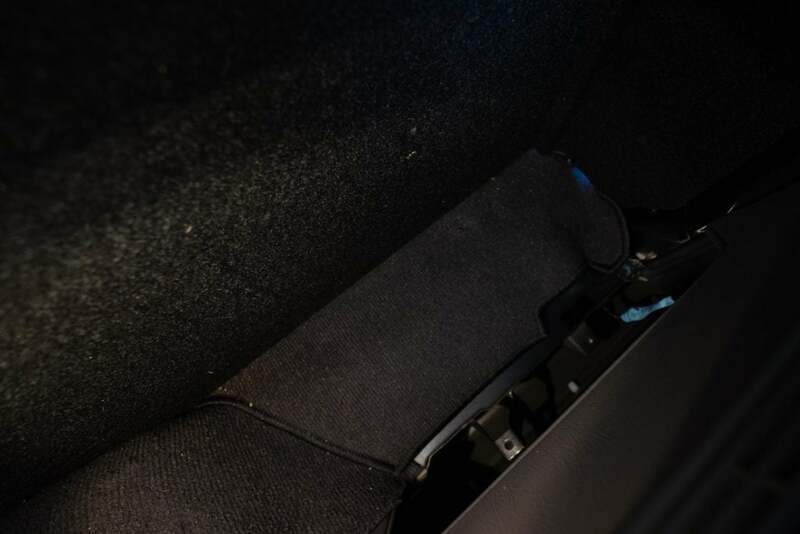 In the back we’ve fitted a Hayman Reese cargo barrier behind the front seats. 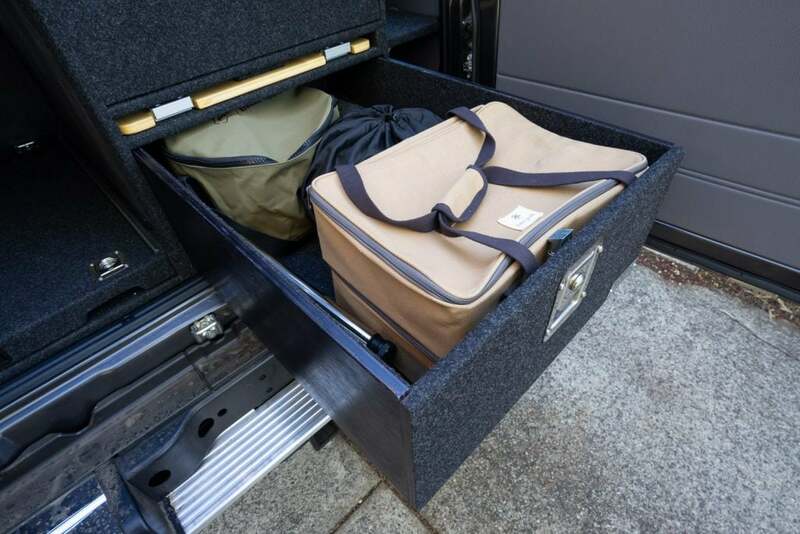 The rear cargo is made to DRIFTA specs to suit the drawers and water tank. We’ll add some simple shelves that are easy to remove, and are light soon. 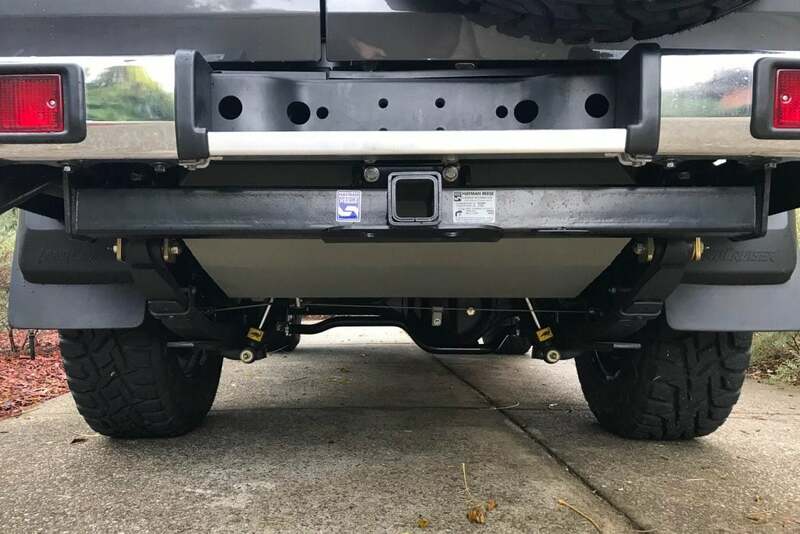 Any heavy cargo will live on the floor – forward of the axle, and low. The other shelves we’ll use for our personal gear, and things like camp chairs. Our goal is to be able to get to all the everyday gear without double handling. 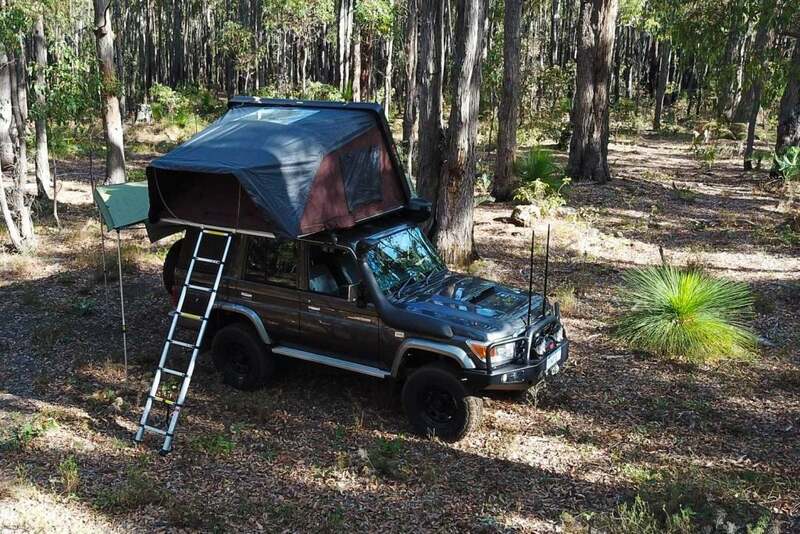 For overlanding style trips we love hardshell rooftop tents. This time we’re trying an iKamper. New to the market, iKamper burst onto the scene in 2017 after raising a whopping US$2.3 million on Kickstarter! We’ll show you how these work separately soon (stargazing roof window and all). With a wagon it’s hard to beat 270° of shelter. While I like the speed of the freestanding models, to shave a few kilos, and to allow for pitching at sharper angles we’ve gone for a DRIFTA Rapid Wing. In strong winds and bucketing rain we’ve always found substantially lowering the outside edge of the awning stops the wind from gusting under as much and helps with drainage. We’ve replaced the rear windows with Front Runner Gull Windows. 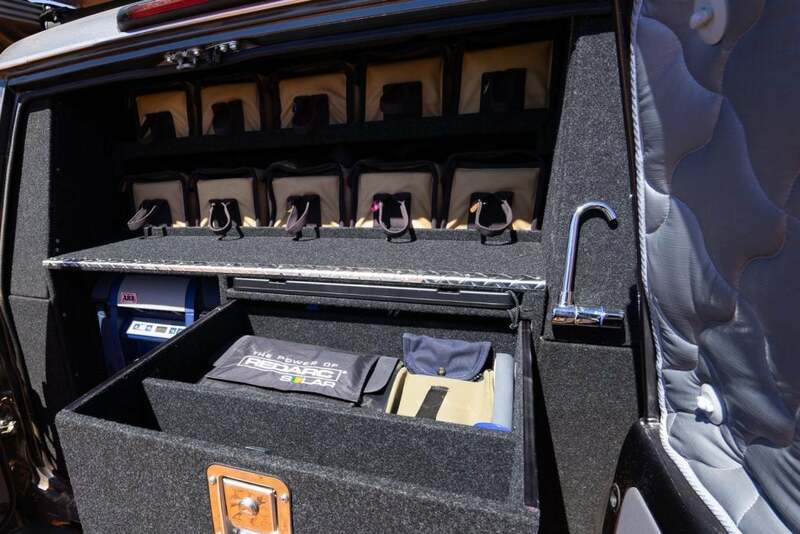 We’ve boxed out the insides, and the left side will be filled with our REDARC electrical system and the right our recovery gear and tools. We’ve got plans for the low and hard to access space too. 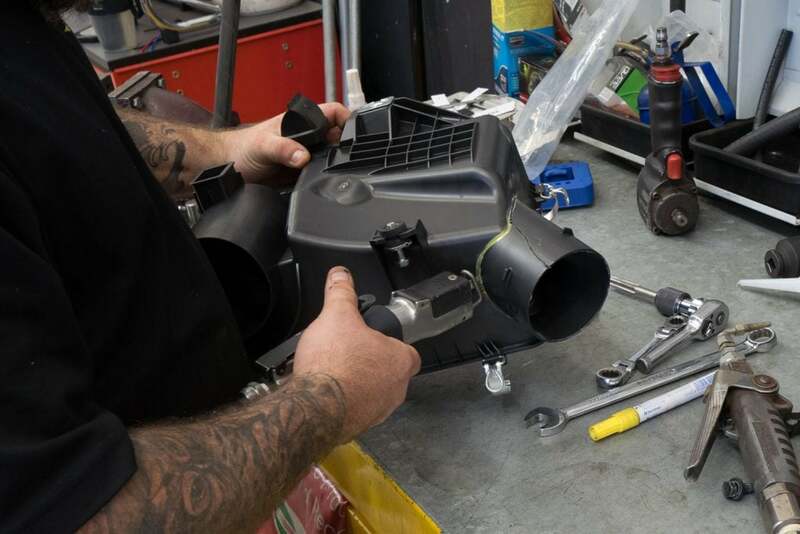 While the factory fitted 130 litre fuel tank isn’t small, for long trips it’s not enough. 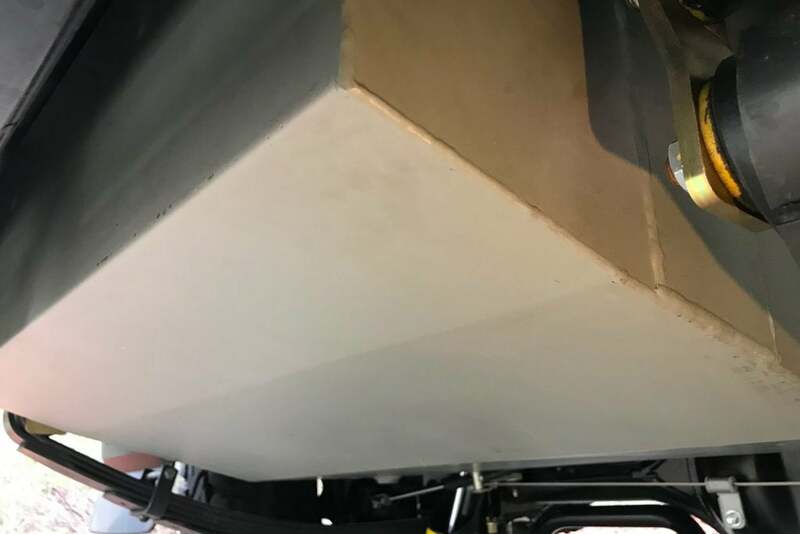 We’ve fitted a 180 litre aluminised steel Long Ranger tank which is neatly designed to avoid a decreased departure angle. 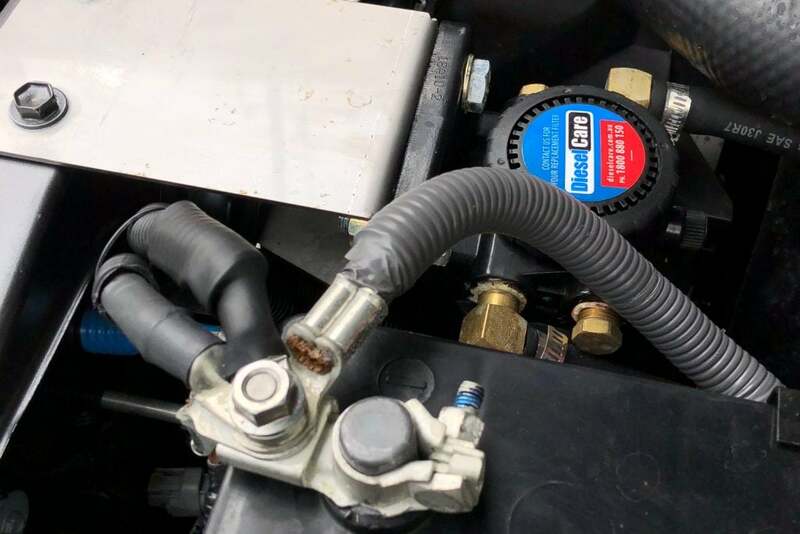 On the subject of fuel, we’ve added a Diesel Care Secondary Filter just in case any contaminates get by the factory filter. 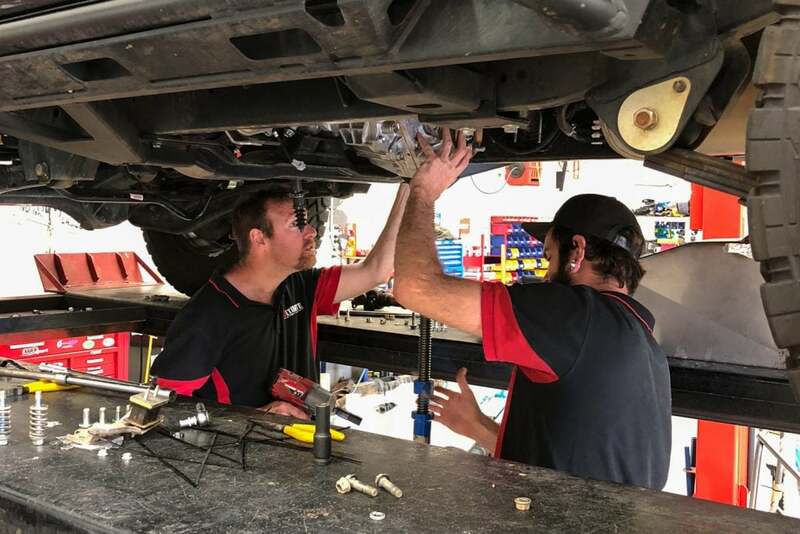 Since our last update, the guys from Install A Gadget have been working hard to install our remaining electrical gear as well as wire everything up – no small job. 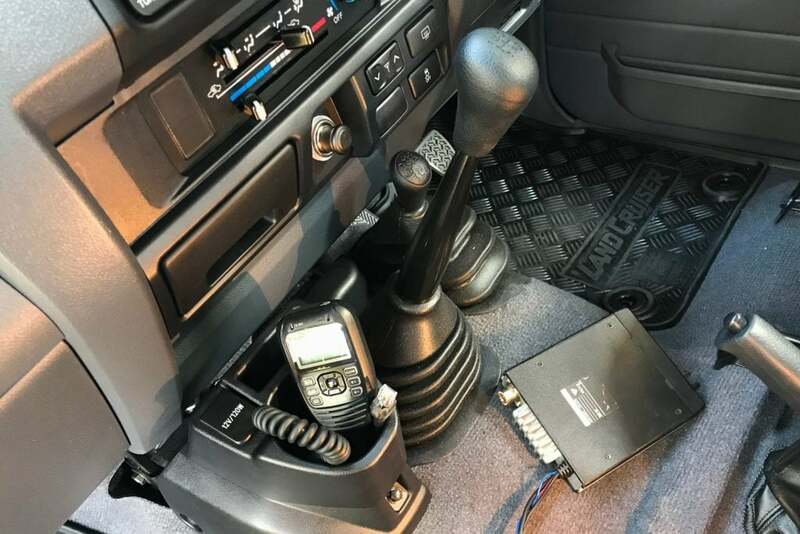 We’ve mounted our Icom IC-450 out of the way of the gear stick on the passenger side. 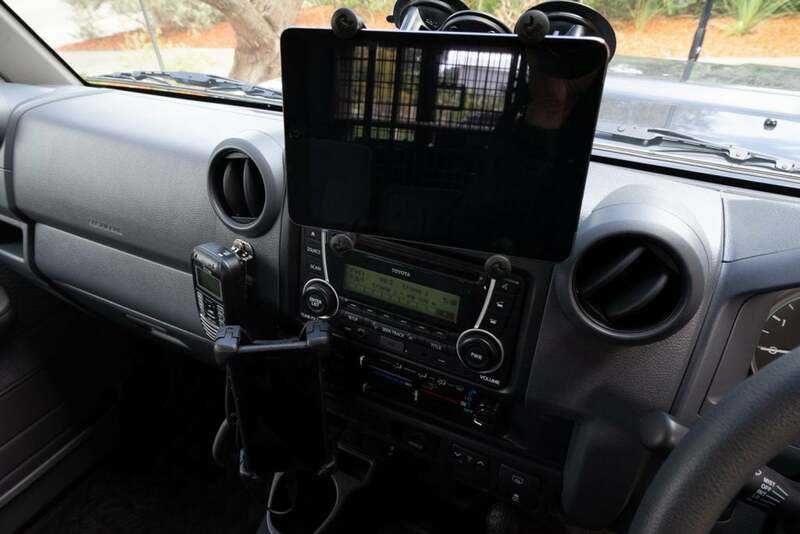 The guys neatly placed the cord connection near the handset which means it reaches the passenger and driver with less stretching. Next to that is our Bury iPhone Cradle which connects to a RFI CDQ7195 4G Antenna. Above that we’ve mounted an iPad Mini running the Hema Explorer App PRO. 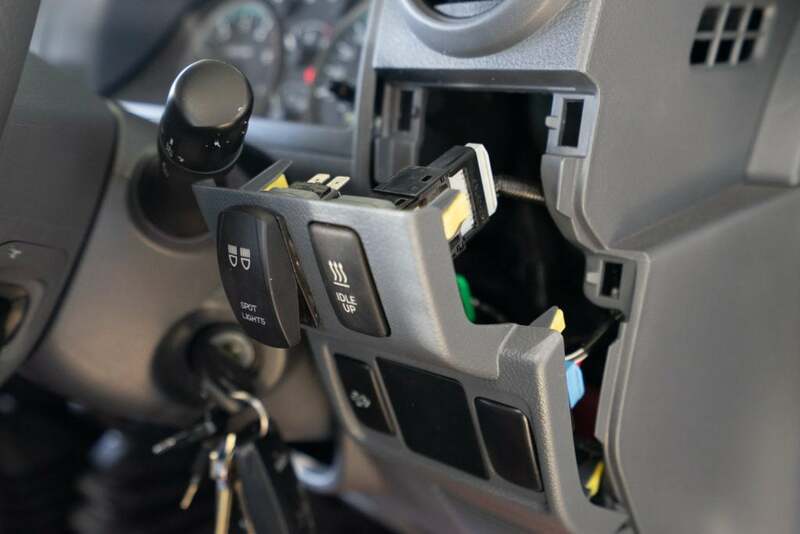 We have used a double RAM suction mount, as we have previously found it would randomly fall off with a single. 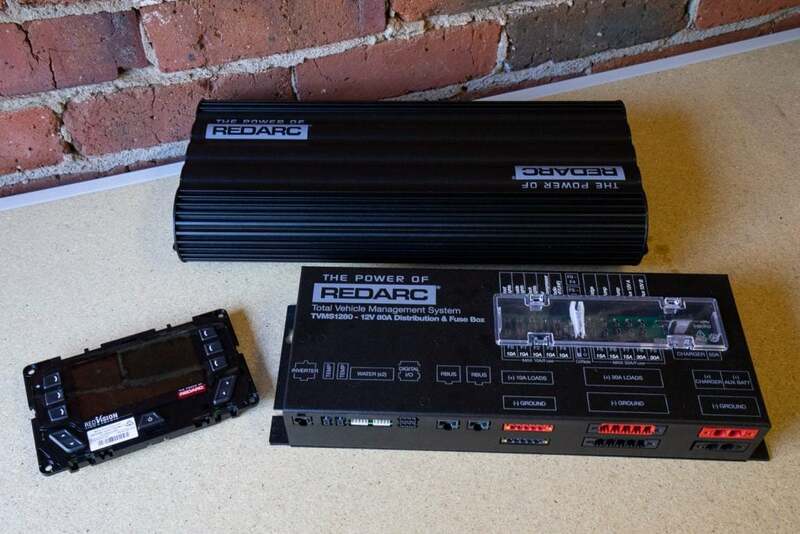 The power for the radio, iPhone and iPad all runs off the second battery – it’s handy as we often use them when the car isn’t running. 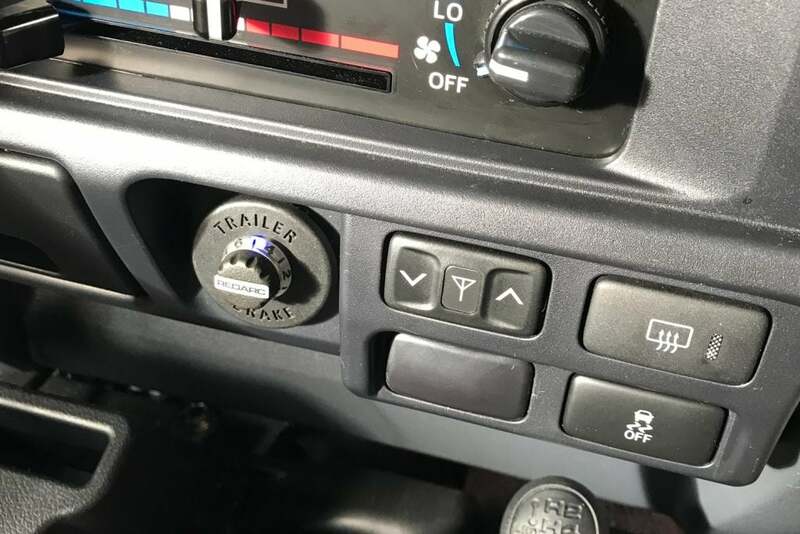 The guys neatly recycled the cigarette lighter as a neat spot to house the REDARC Tow-Pro Elite electric brake controller. Cracking on this week, the guys from Install A Gadget finished our electrical system. 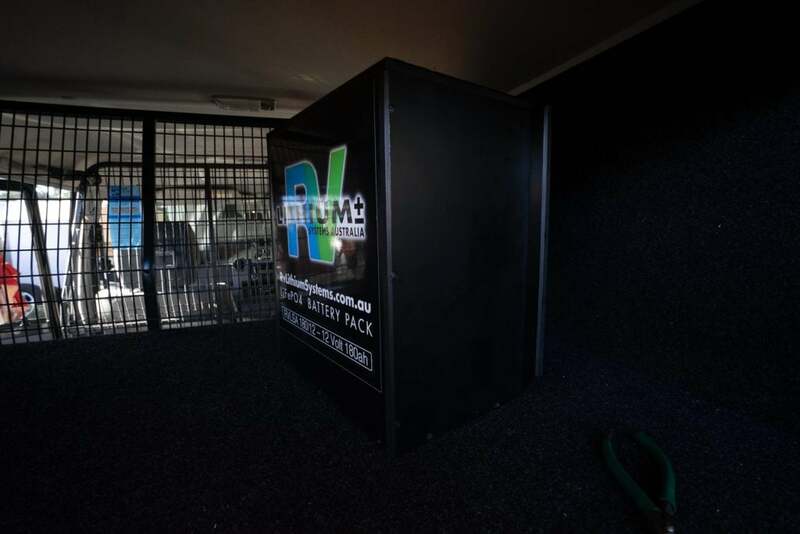 It was a massive job, and we’re stoked with how neat the install is! 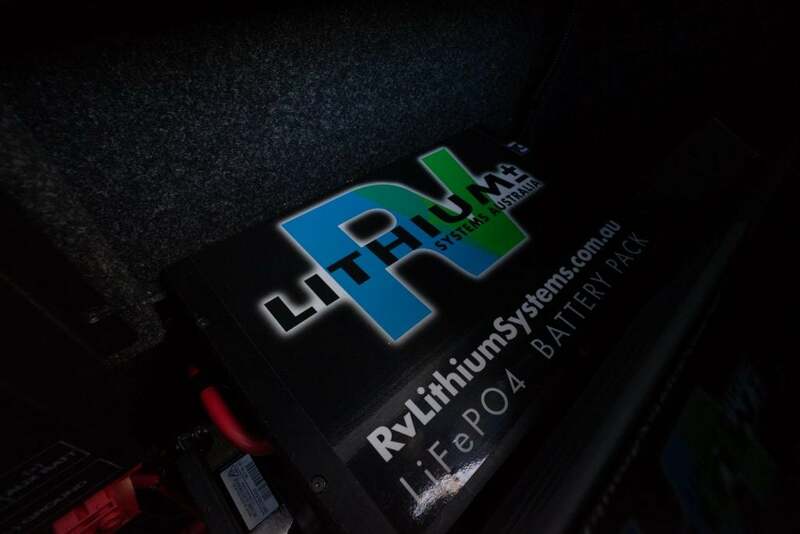 Paul from Install A Gadget also operates RV Lithium Systems. They specialise in high quality batteries, and can uniquely custom build them in different shapes. 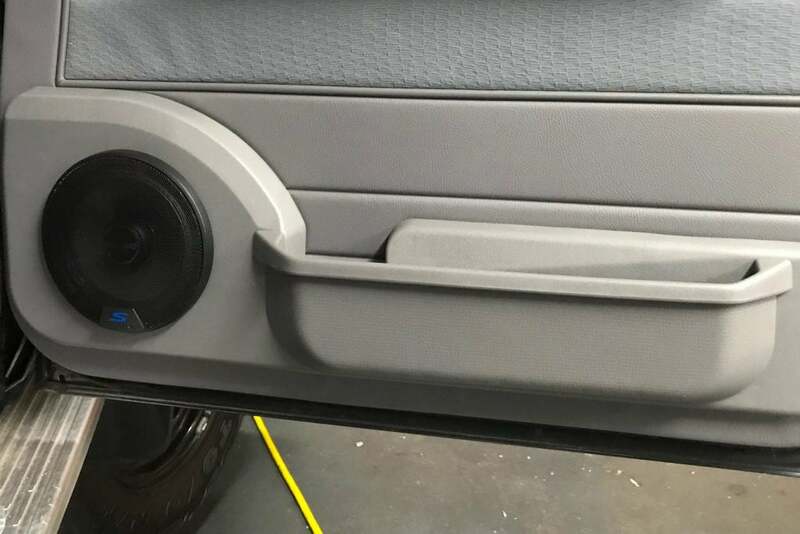 We positioned the battery beside the drawers and behind the wheel arch on the passenger side. 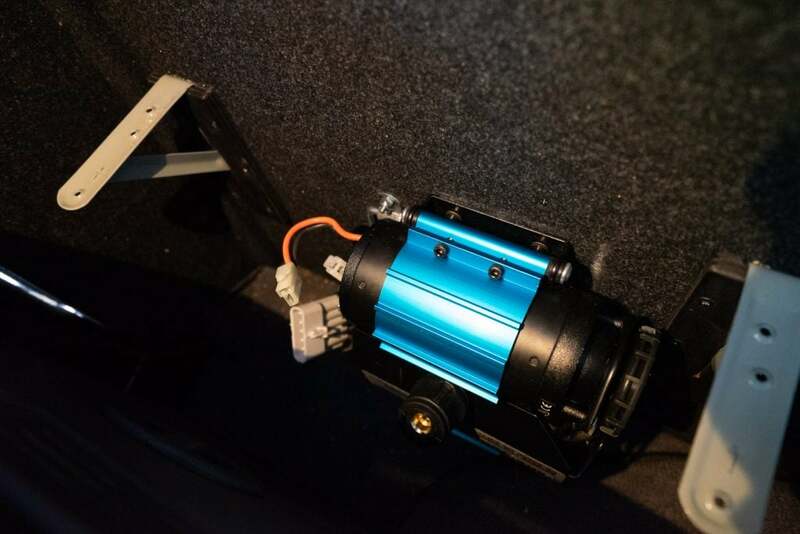 Paul had originally thought a 100 Ah battery would be the limit for the space, but after building a test box they confirmed they could fit in a whopping 180 Ah unit. This 180 Ah lithium battery is only just taller than a standard AGM battery. Being lithium powered means it’s equivalent to three 100 Ah AGM batteries, but roughly a quarter of the weight and almost a third of the size. Lithium batteries aren’t cheap, but they far outlast AGMs, so the true cost of long term ownership make them more reasonable. We’re planning on keeping this vehicle for a long time, and for us the benefits in performance, weight and size are worth it. 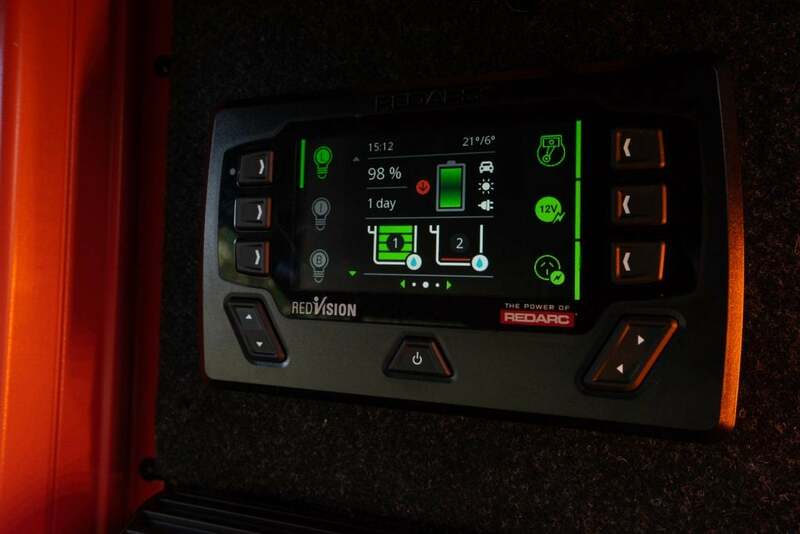 The RedVision control panel is really intuitive and consolidates a tonne of gauges and controls into one display. 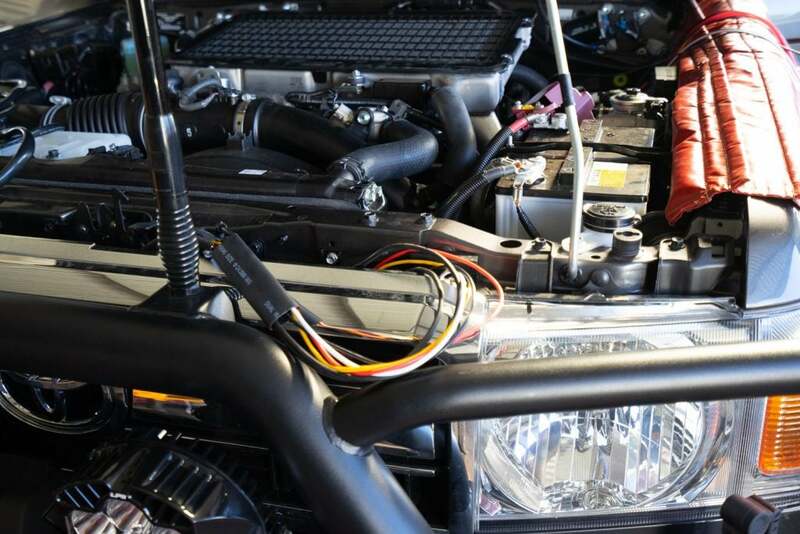 Our lights, air compressor, water pumps, inverter, and more can easily be toggled on and off. 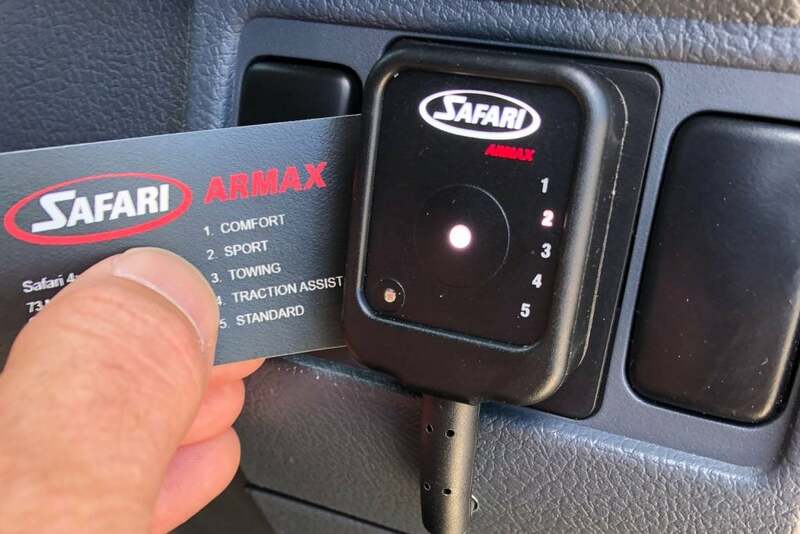 Our power levels, water tank gauges, in vehicle and fridge temperatures are also displayed, along with historic power usage and charging records. 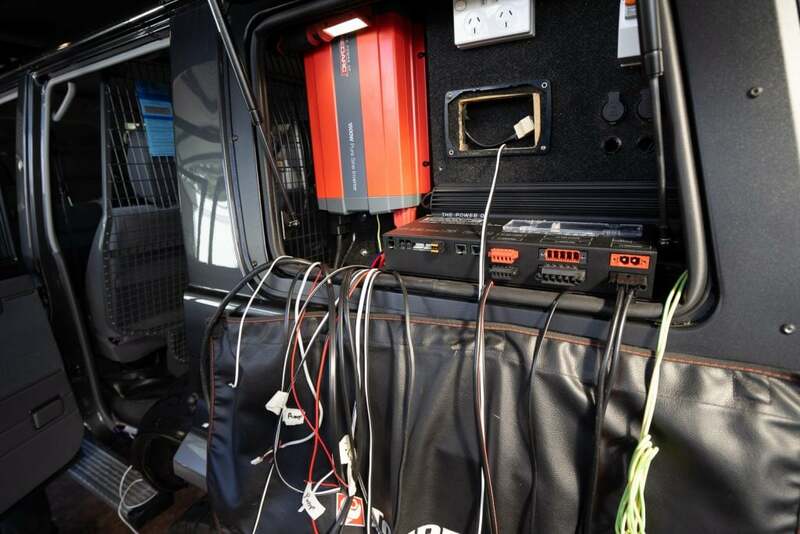 RedVision also pairs with an App that mirrors both the display and functionality of the system – it’s perfect to have access to this when you’re on the road, or even up in the rooftop tent. In the void beside our rear drawers on the right we’ve mounted an ARB Twin Compressor. We’ve left plenty of air space around it to cool down. In that space we’ve also mounted one of our small water pumps. 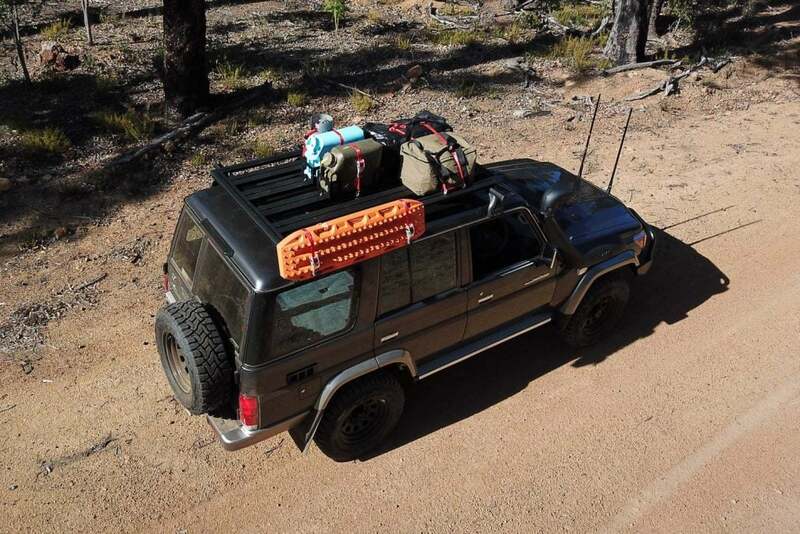 Above that space and inside a second Front Runner Gull Window we store some of our 4WD and camp tools and recovery gear. Above our drawers we’ve fitted an easily removable shelf. We can store 10 of the large Snow Peak Tote Bags. They are deceivingly big – one can hold 22 tins of beer! We’ve spoken to people that found Dynamat on the doors made the biggest to cabin noise in the 70s. Being mindful of weight we’ve started there. 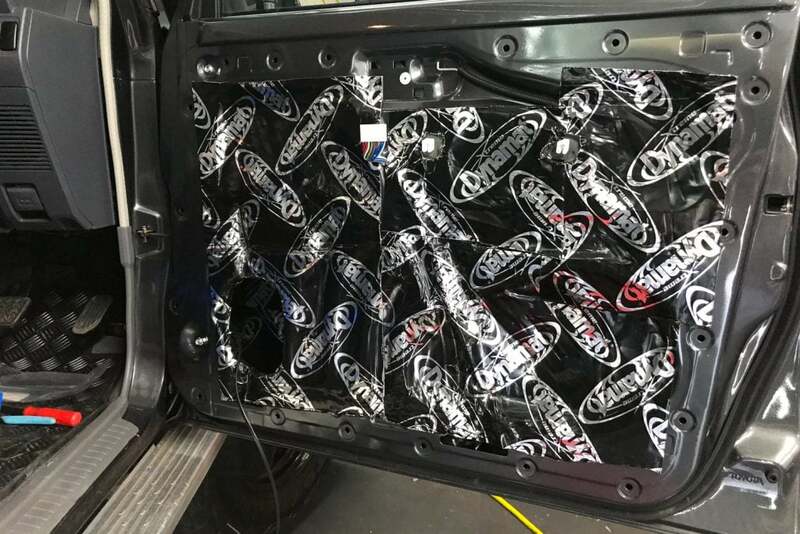 The guys at Free DB did a great job sound proofing thinner and outer door. 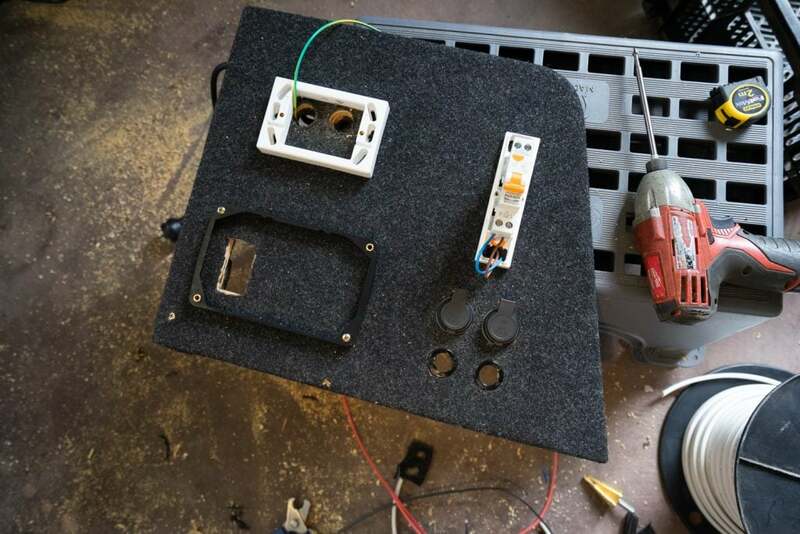 While they were at it they fitted some Cruiser Consoles Speaker Pods to accomodate some basic Pioneer speakers. 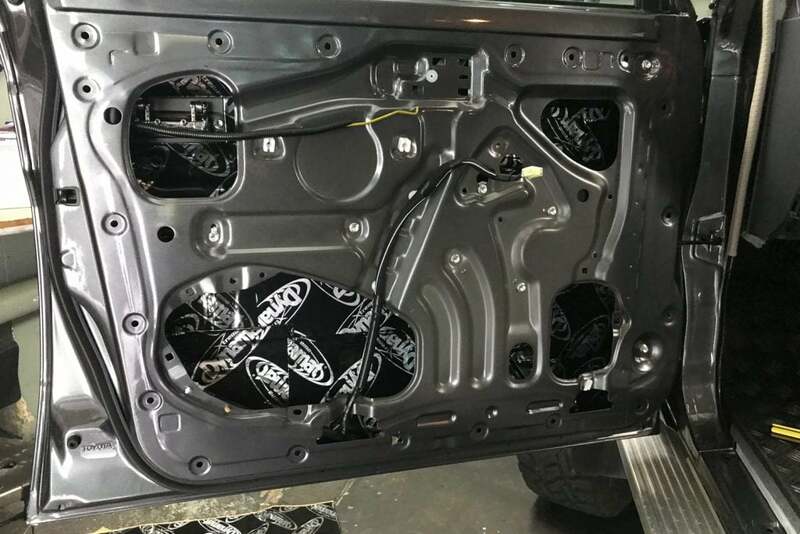 The sound deadening and improved sound has made a massive difference. 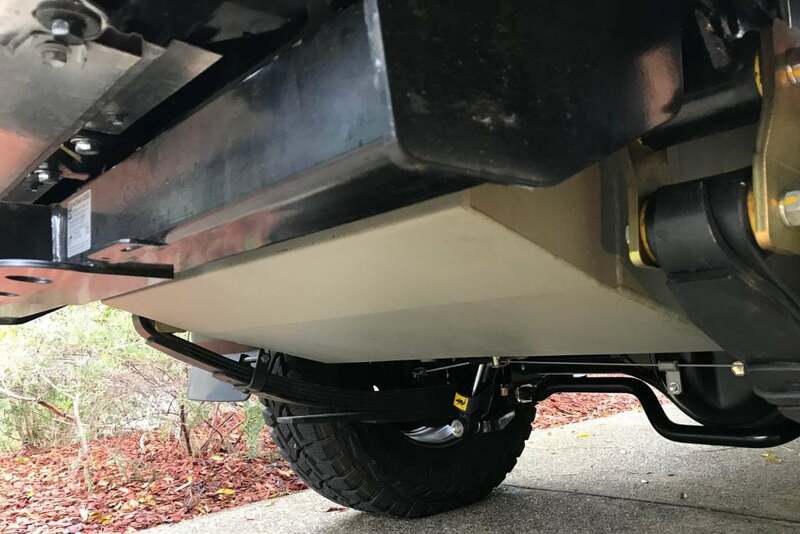 To get more weight forward and low we fitted a second water tank underbody from Long Ranger. 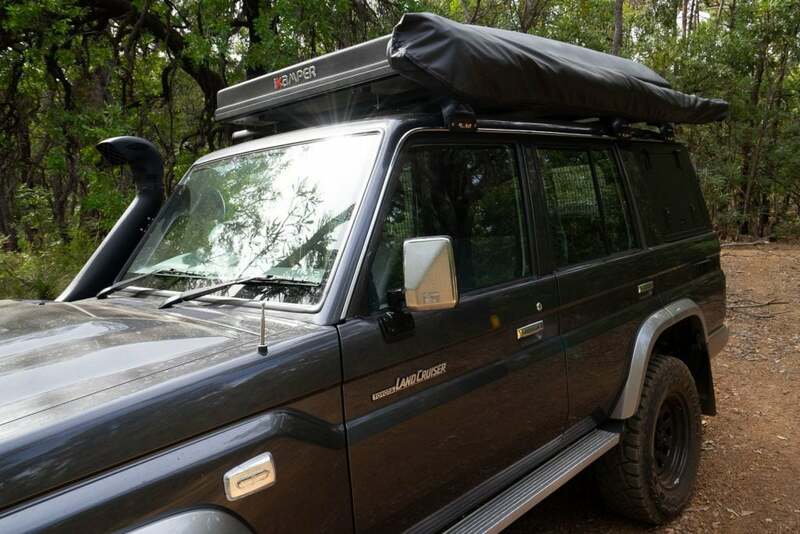 To get the weight of our spare wheel off the door and to allow us to carry an additional 40L of fuel the guys at MAC 4×4 fitted a Uneek 4×4 Rear Bar. 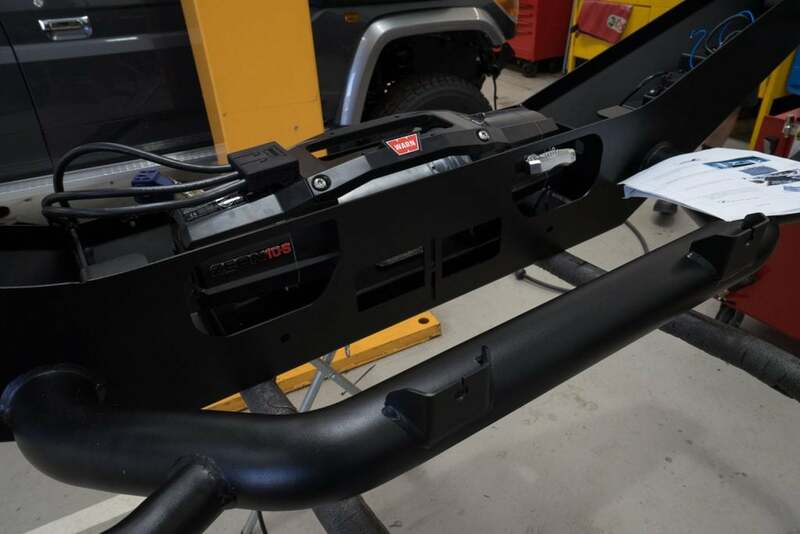 Our MAXTRAX are mounted with their Rear Wheel Harness. To improve our ramp over and sill protection we also fitted Uneek 4×4 Sliders. They are a grippy step and have good jack points too. 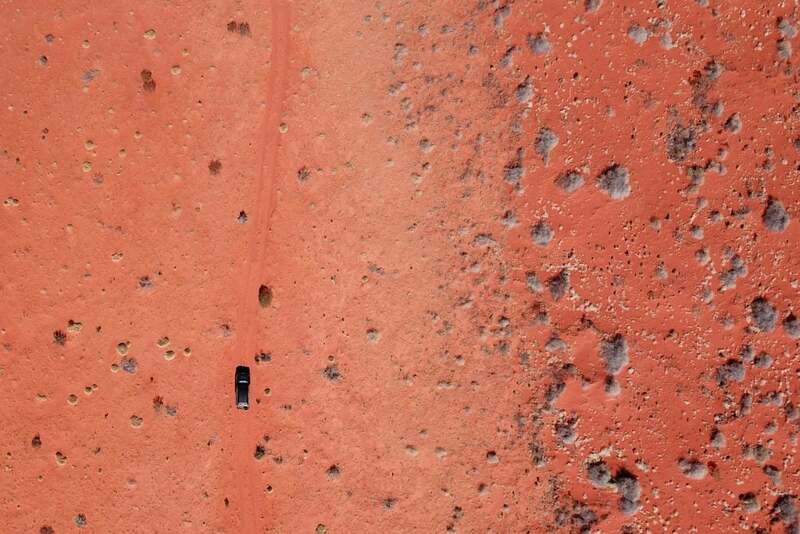 In August we headed off on our first big trip through Central Australia and along the Hay River Track and French Line. The Cruiser performed beautifully, the electrical system was incredible and the camping setup work was super easy. Since the trip we’ve made a couple of changes. 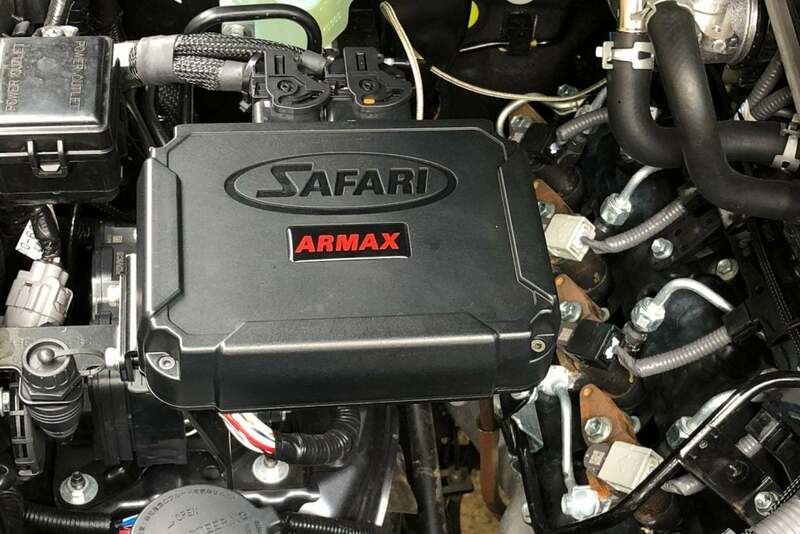 To offset the additional weight of the build and remote touring gear the guys at Ultimate added a Safari ARMAX ECU. 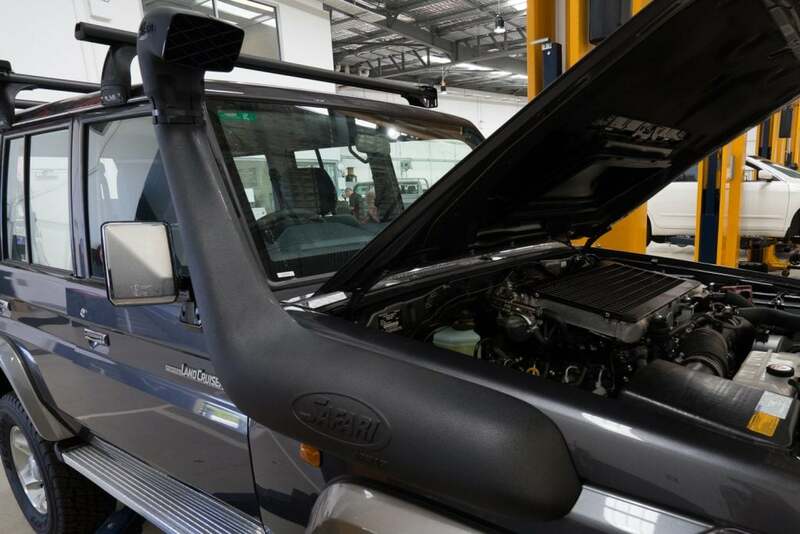 We’ll write about why we chose this one soon, but the gains in power and torque are significant, and Safari’s focus on engine longevity was what we were looking for. 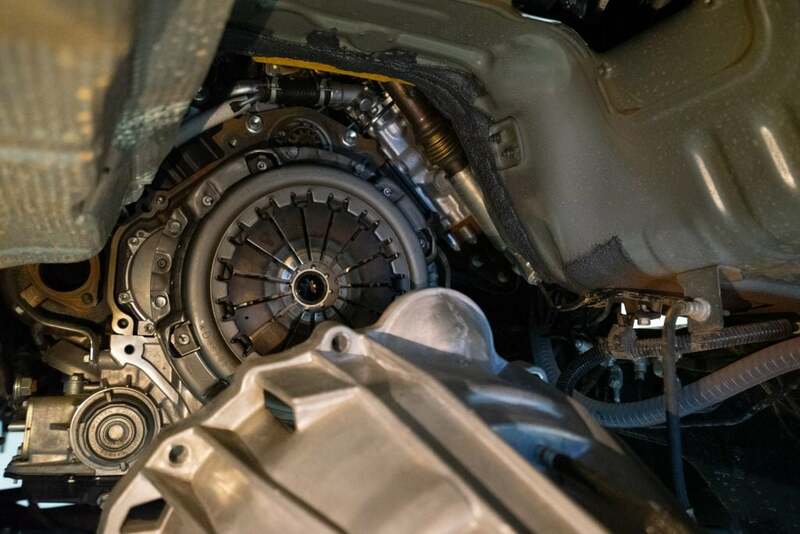 The 70 Series clutch is a known weak spot, especially under heavy loads or with increased power. 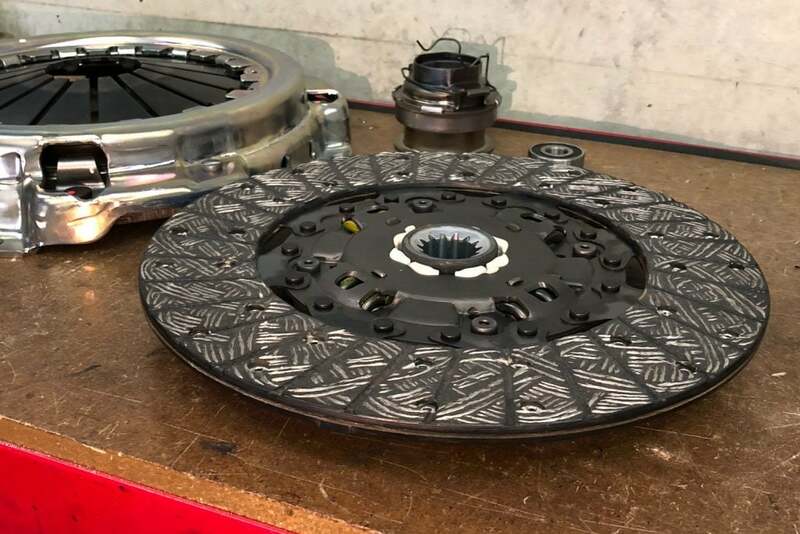 To make sure ours didn’t slip someplace remote, the guys at Ultimate fitted a Safari ARMAX Clutch. 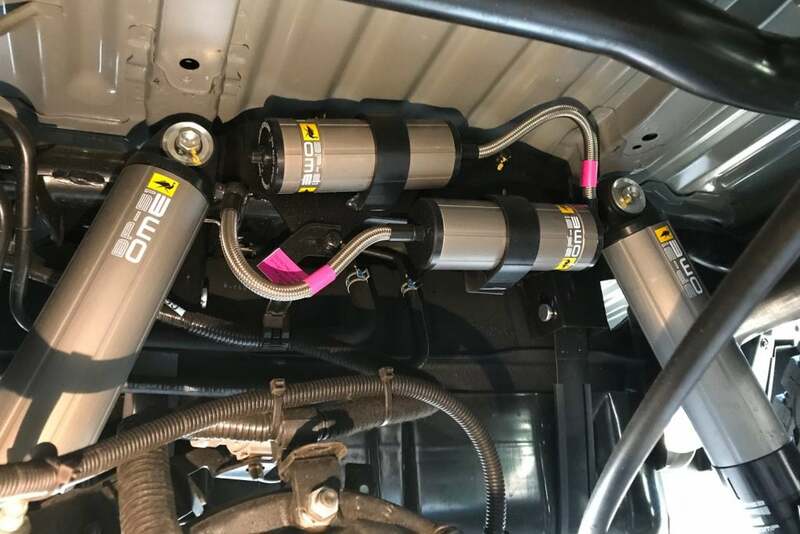 Our suspension system worked really well, but at full water, fuel and gear it sat a little in the rear. We had already upgrade from 400kg to 600kg leaf packs, and while there is an 800kg option we were worried it would be too stiff. 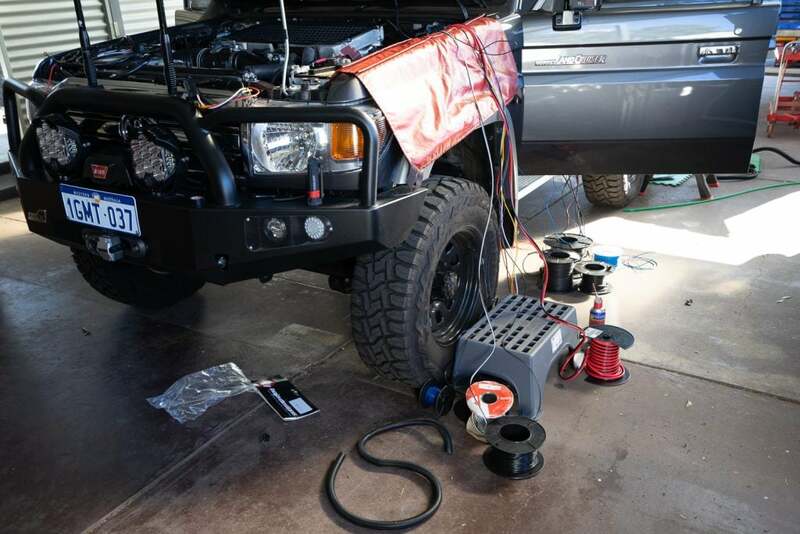 We’ve added an Airbag Man Helper Kit. 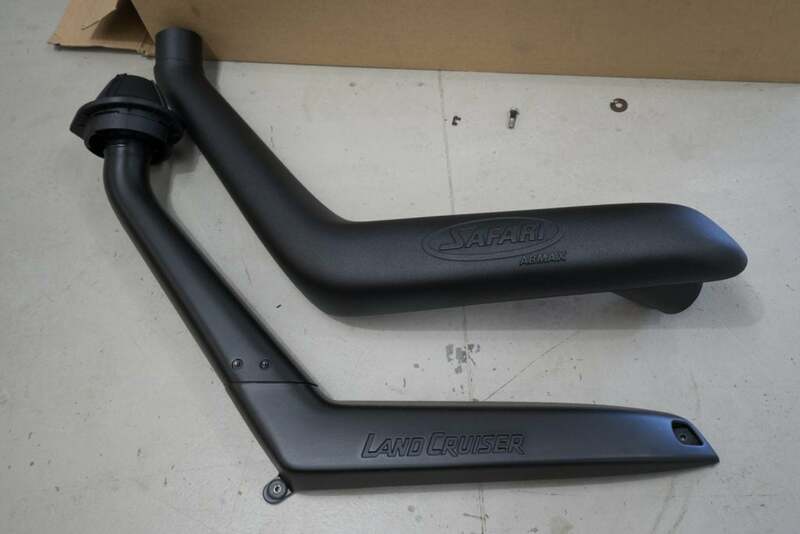 These are designed to assist the leaf packs without make the rear too firm. The big bonus is we can adjust the pressure to keep the Cruiser level whether we are full, empty or towing.